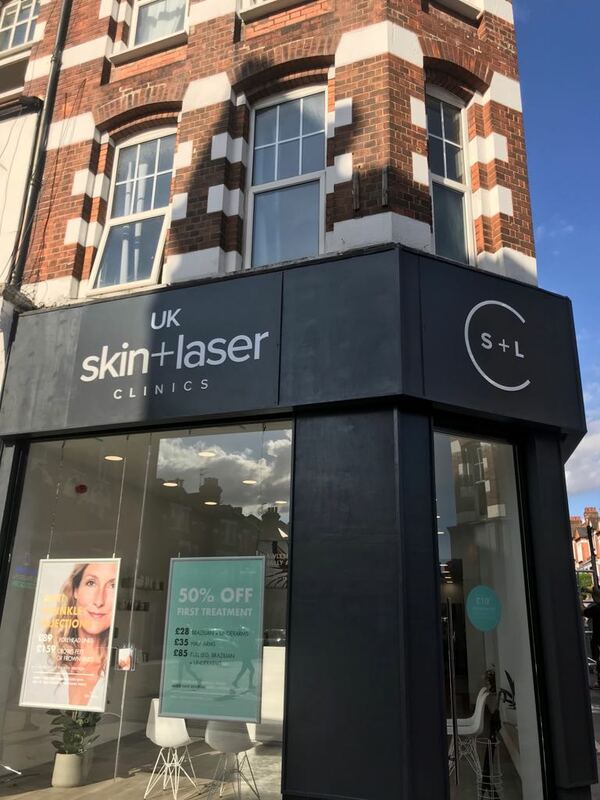 UK Skin and Laser Clinic in Clapham, London is a new business venture in the UK from leading Australian practitioners. 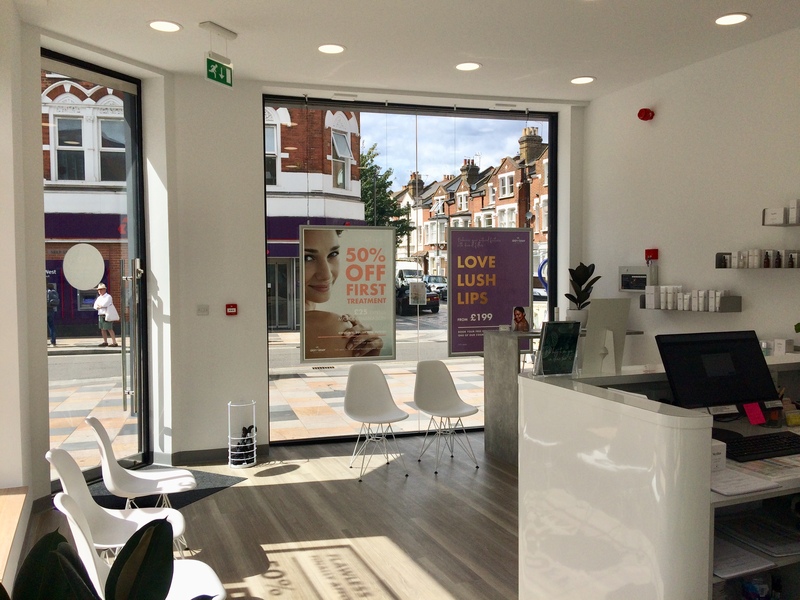 They needed a clinic where they could offer state of the art skincare and laser hair removal technology, however, the property they had acquired needed a considerable amount of work to transform it into the exceptional venue they envisaged. 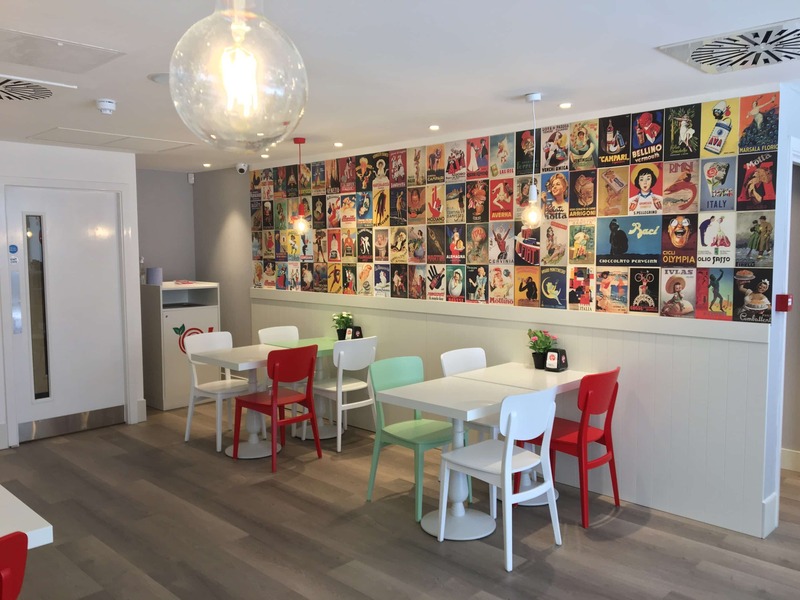 As this was their first premises in the UK, they were looking for an experienced team who could help to guide the project from start to finish. This meant working with the clinic to shape the brief, adhere to UK compliance guidelines and meet any unforeseen challenges with a “can do” attitude. 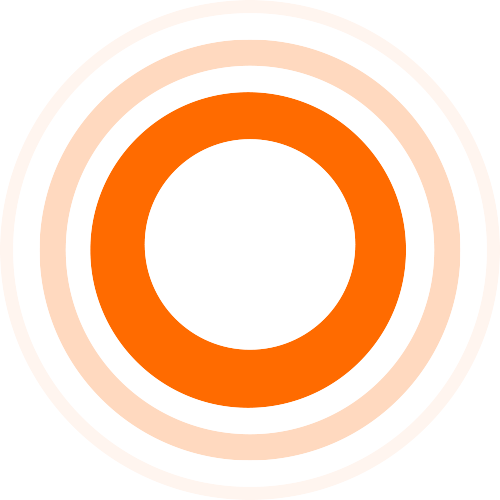 “We wanted to partner with someone we aligned with on a personal level, who wasn’t overly structural in their approach and who could allow for some flexibility on our part. 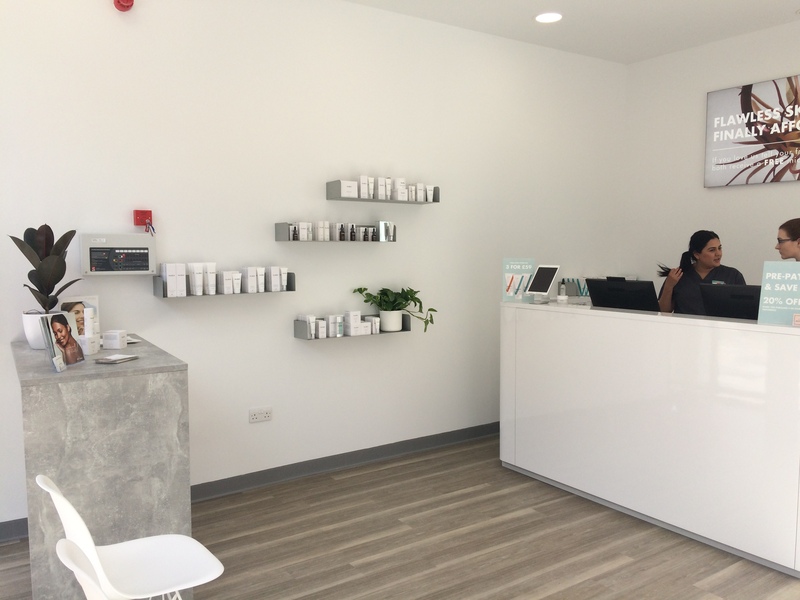 Other companies we spoke to seemed very rigid in their approach but we needed someone who wouldn’t sweat the small stuff and essentially partake in the process to work out what we needed, coming on the journey with us” – Sam, Owner of UK Skin and Laser Clinics. The unit was to be split into 4 independent treatment rooms, a reception and waiting area, bathroom and staff room with a high spec finish. 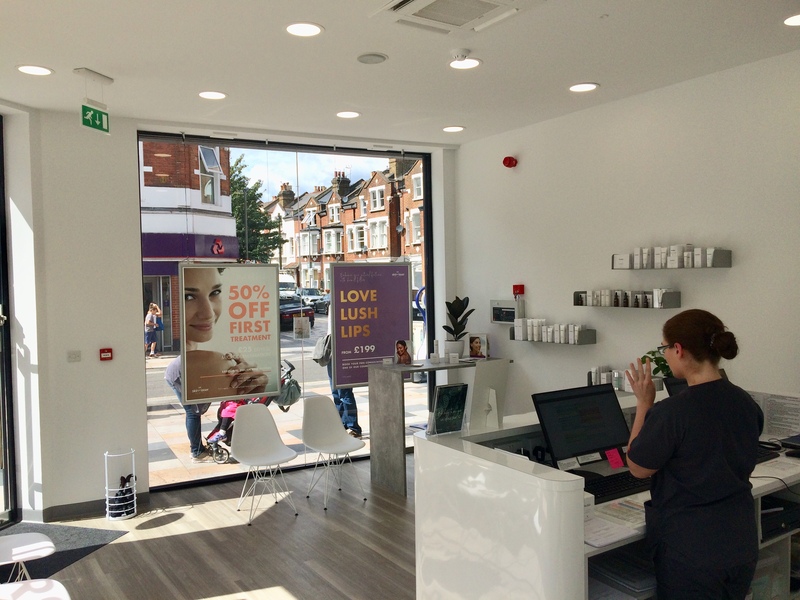 The unit also required a new shop front with floor to ceiling glass doors and windows and illuminated signage. 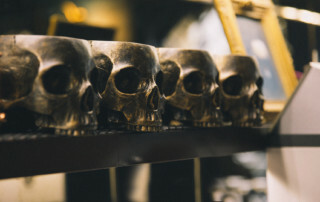 The current building had not been maintained in years, was in poor condition and needed considerable structural repair which hadn’t been initially expected. 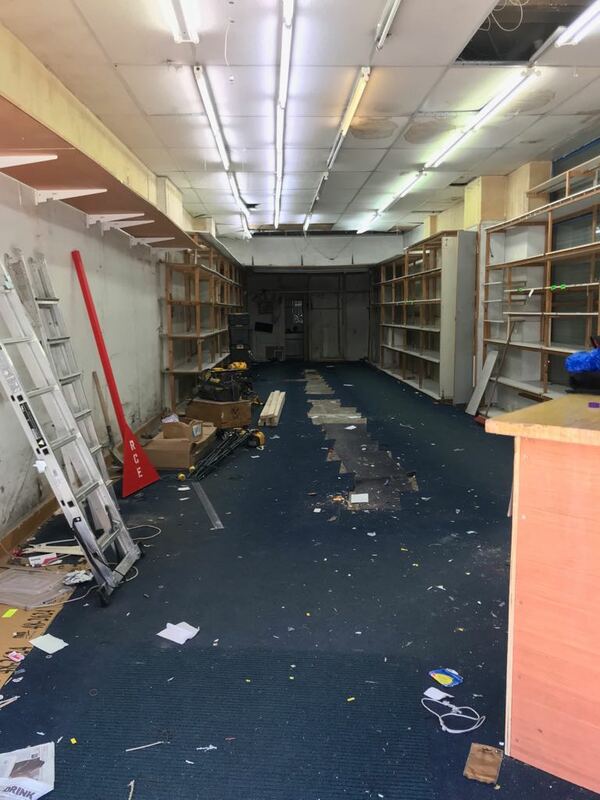 Instead of receiving a shell unit for fitting out immediately, once we started stripping the existing building back in preparation we found that this wasn’t the case. 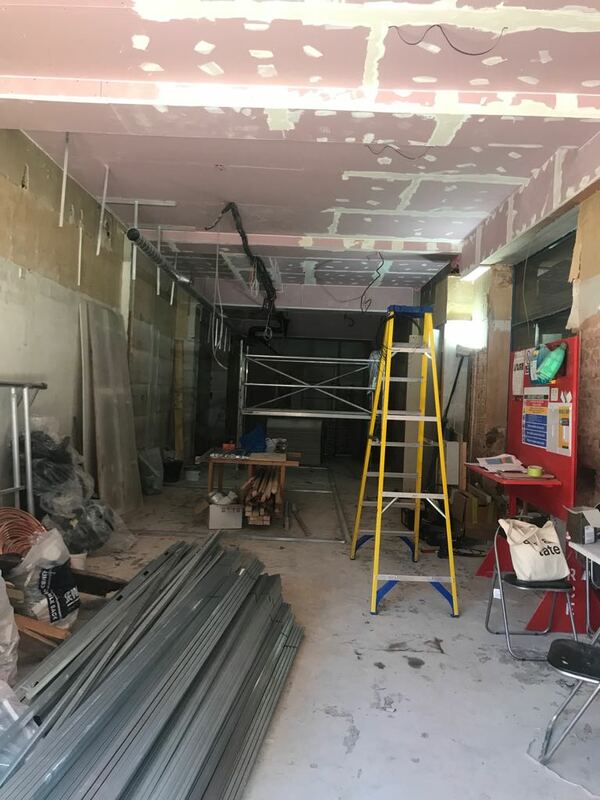 This included repair to the floor of the flat above the clinic, segregating the ground floor clinic from the above property, dealing with serious damp issues and fireproofing. RCE Services tackled these problems by repairing the floor of the property above the clinic in just two days (waiting for the landlord of the above dwelling to act would have been a lengthy process that could have considerably held up the entire renovation). 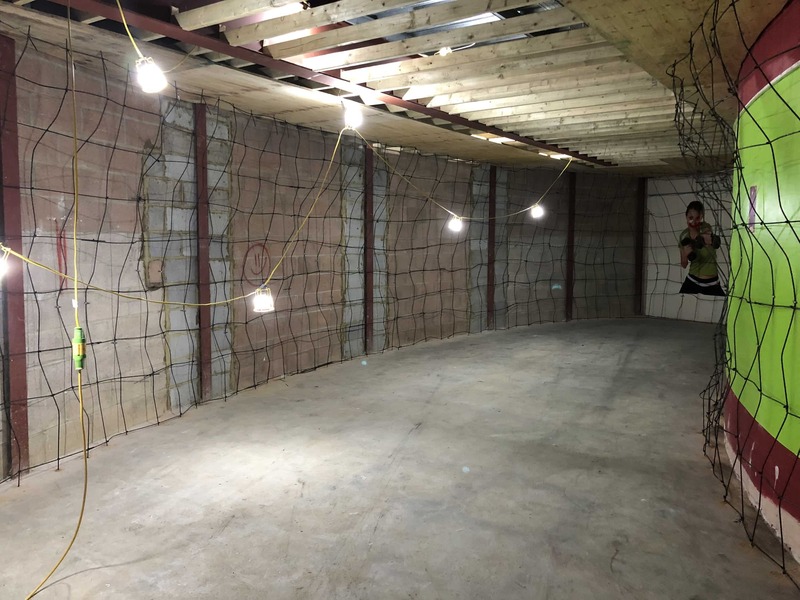 We segregated the ground floor property from the flat above, stripped and tanked the walls to tackle any remaining damp and fire-proofed the lower building. As soon as the unit was structurally sound, we could begin the second stage of the renovation process. 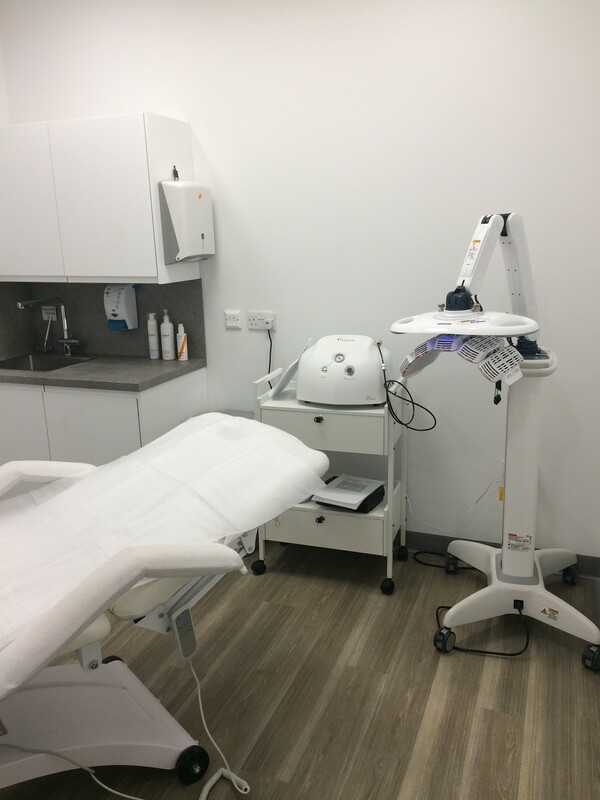 It was necessary that the lighting was optimal for carrying out laser hair removal procedures. We came up with multiple options for the clinic, deciding on fitting the correct CRI indexed, surgical standard lighting for maximum visibility. 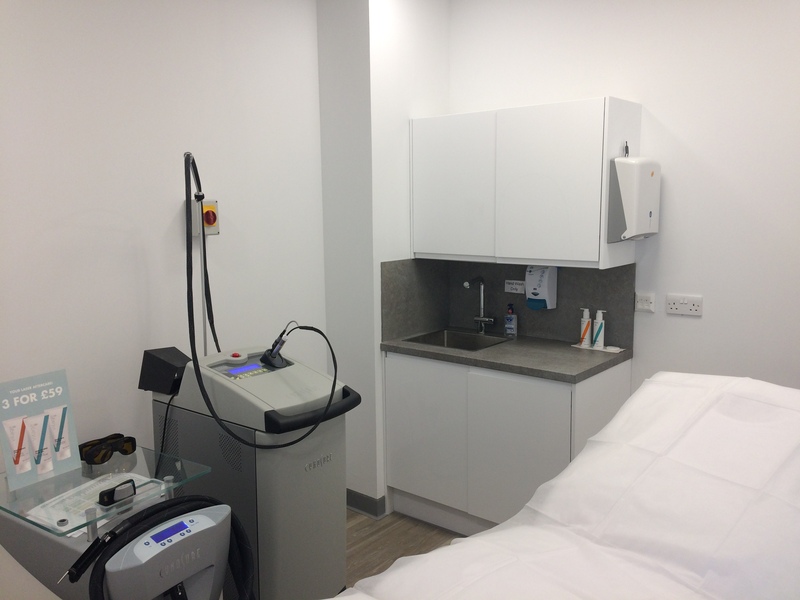 RCE fitted specialist power suppliers for laser hair removal equipment, comprehensive but discreet ventilation and air conditioning to create an ideal, comfortable and safe environment for the clinic to perform their procedures. Plumbing was also fitted into each separate treatment room of the clinic. 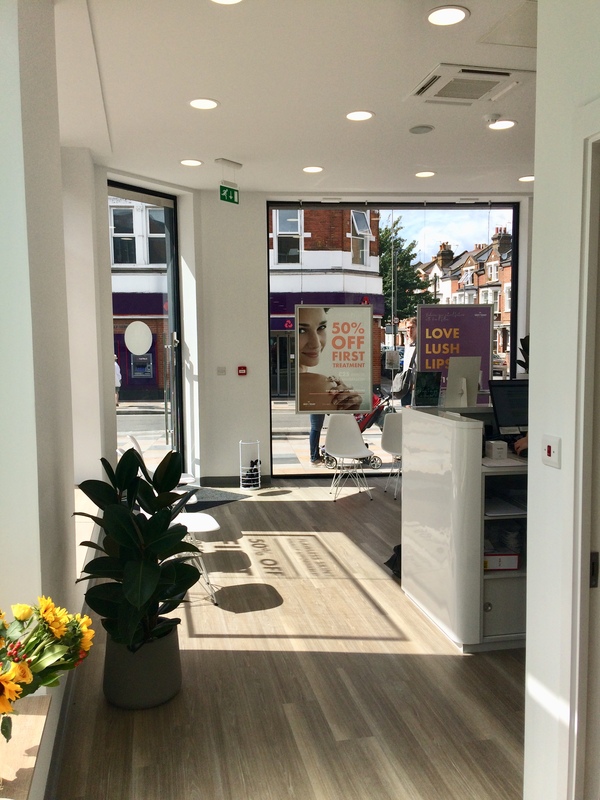 Finally, we fitted Karndean plank (engineered wooden) flooring, bespoke furniture and all treatment room furniture. 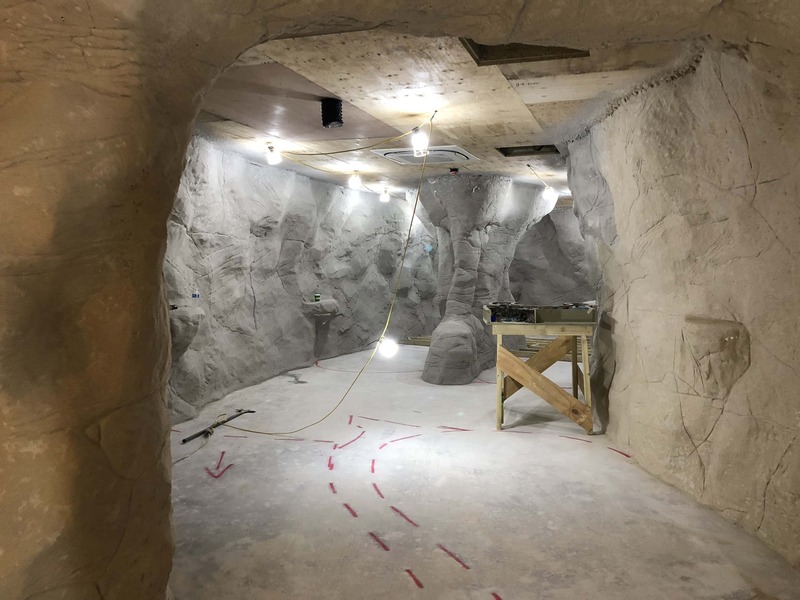 The clinic took five weeks to complete from start to finish. “The build is pretty spot on. We didn’t know exactly how it would turn out as we had so many last minute revisions to the architectural drawings, but this wasn’t a problem for RCE Services. 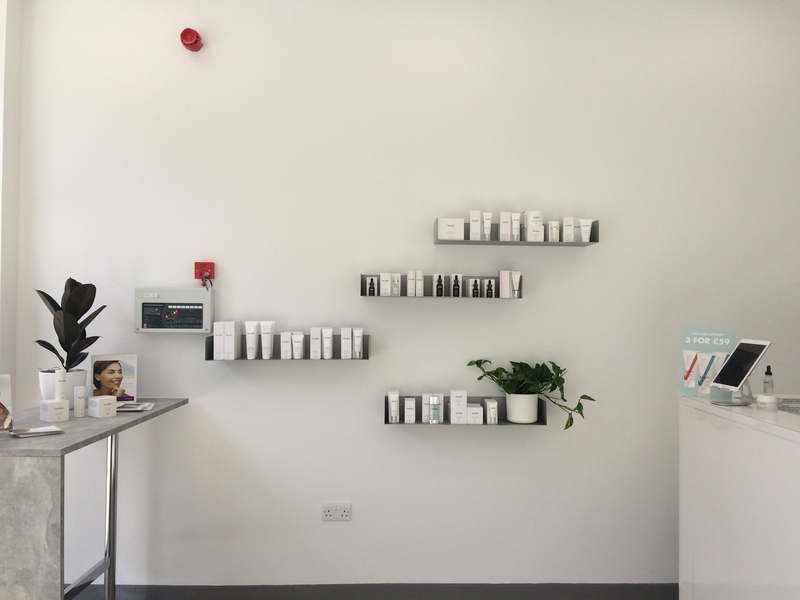 They would definitely be my preference to shop-fit any other clinics we open in future.” Sam, Owner of UK Skin and Laser Clinics. Established housing provider, Accent Group, needed a boardroom creating in their offices that would serve as a central meeting and communications point for their company. 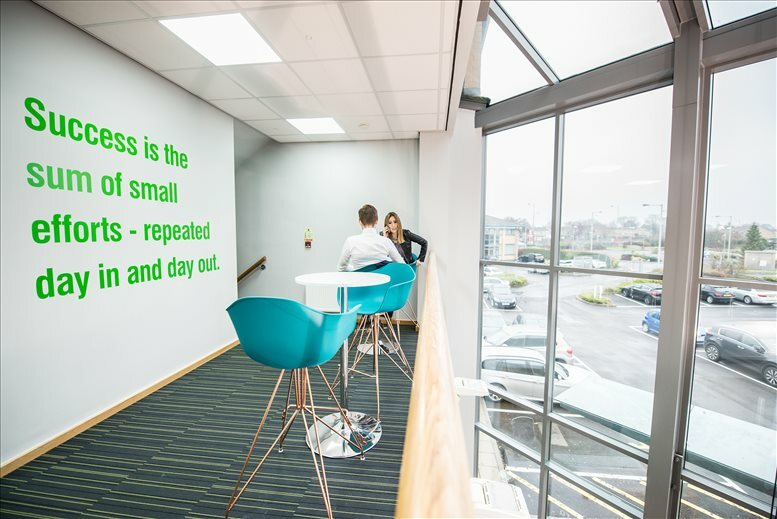 The site for the new boardroom was an open plan office space within Accent Group’s site in Shipley. 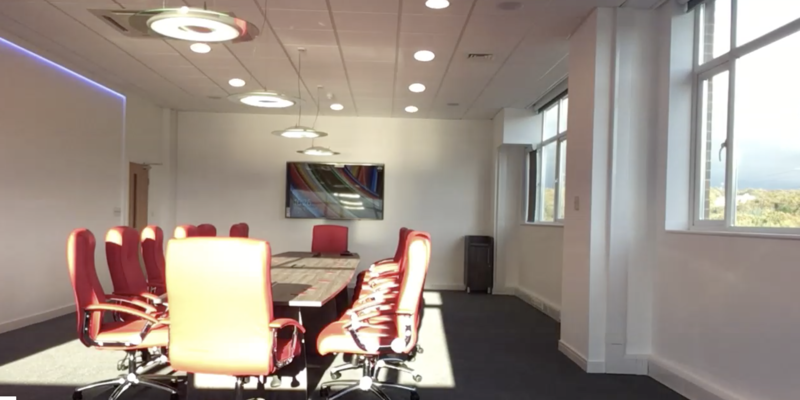 As the Accent Group operates from several locations UK-wide, it was necessary that a new boardroom could accommodate the necessary technology to support conferences, presentations, board meetings and video-conferences. They also required high-spec integrated window blinds coordinated alongside LED lighting dimming and colour change. 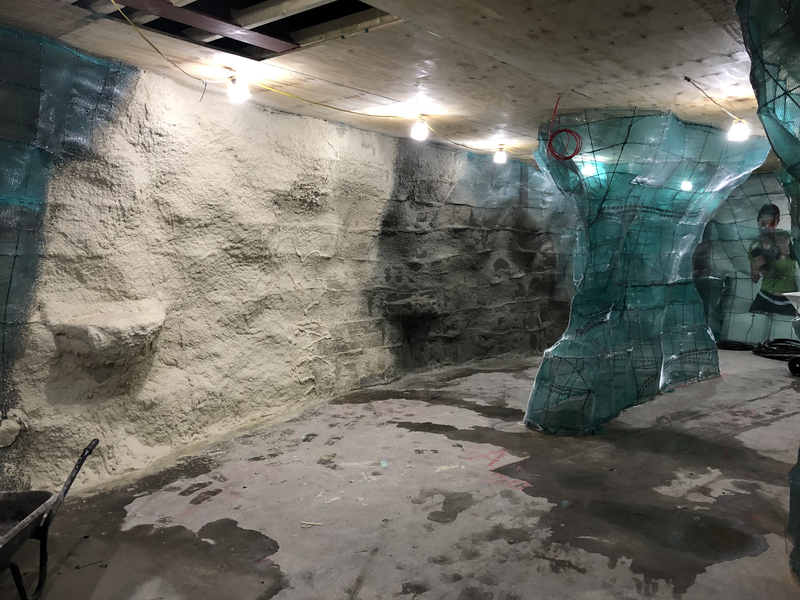 The construction occurred during working hours which required RCE to work quickly and meticulously and cleaning as we worked so as to create minimal disruption. We installed plasterboard partitions, a suspended ceiling, flooring and stud walls to separate the boardroom space from the open plan office. 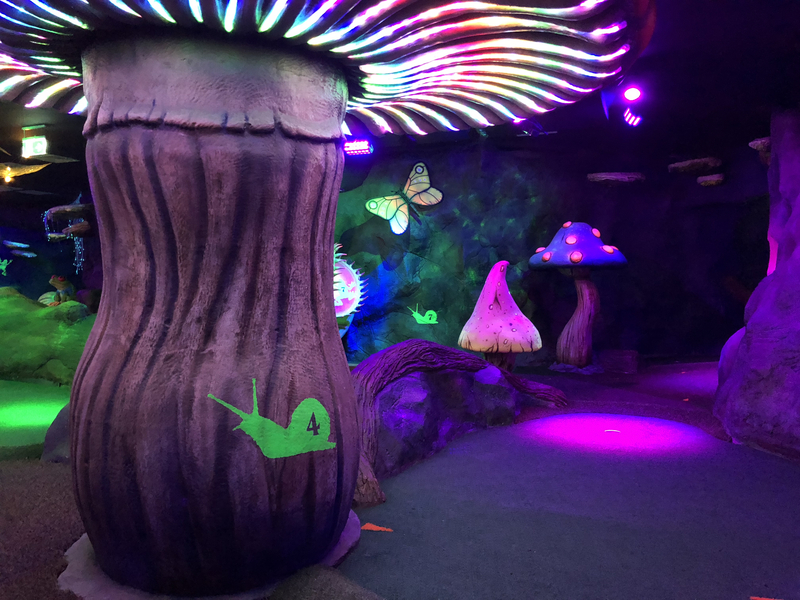 Using an intelligent lighting colour control system we incorporated specialist interfacing for three different protocols including RGB colour changing, Digital Addressable Lighting Interface (DALI) protocol and blind motion controls. 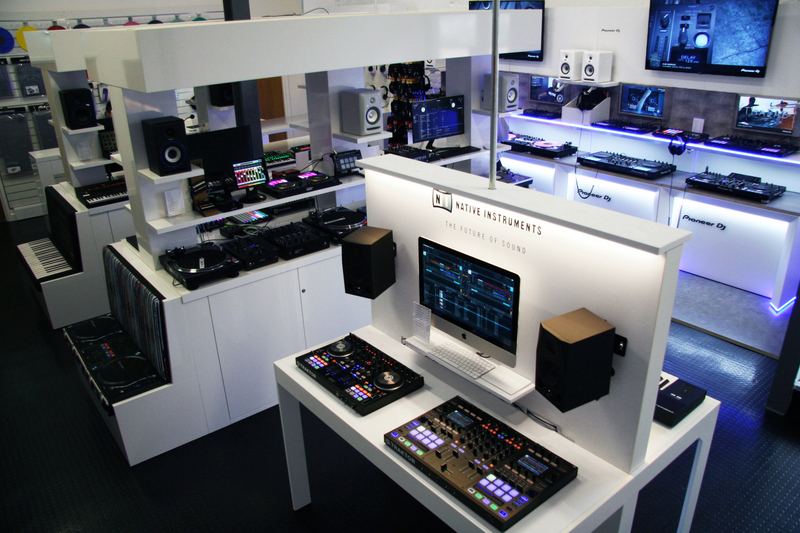 The audio, surround sound and integrated audio was also set up to be operated with a central control. To ensure seamless operation and unparalleled quality and speed, RCE Services also sourced and provided state of the art equipment for presentations and video conferencing. 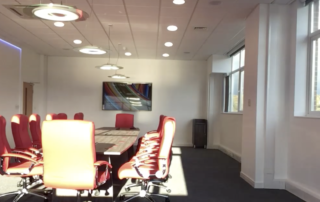 Construction of the entire boardroom was completed in just four weeks including decorating, electrics and AV. 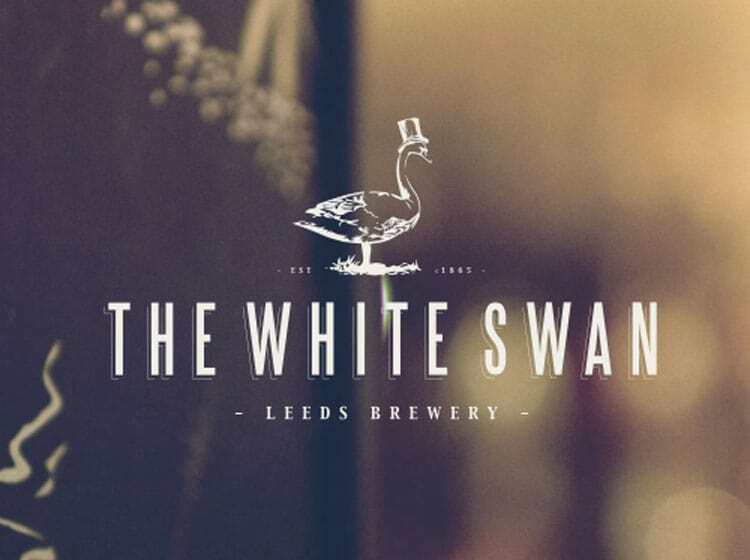 The notoriously popular Leeds bar, The Maven, wanted to expand their premises to include a cool and vibrant restaurant above their first business; a speakeasy-style cocktail bar on the first floor of a Victorian building in the centre of Leeds. 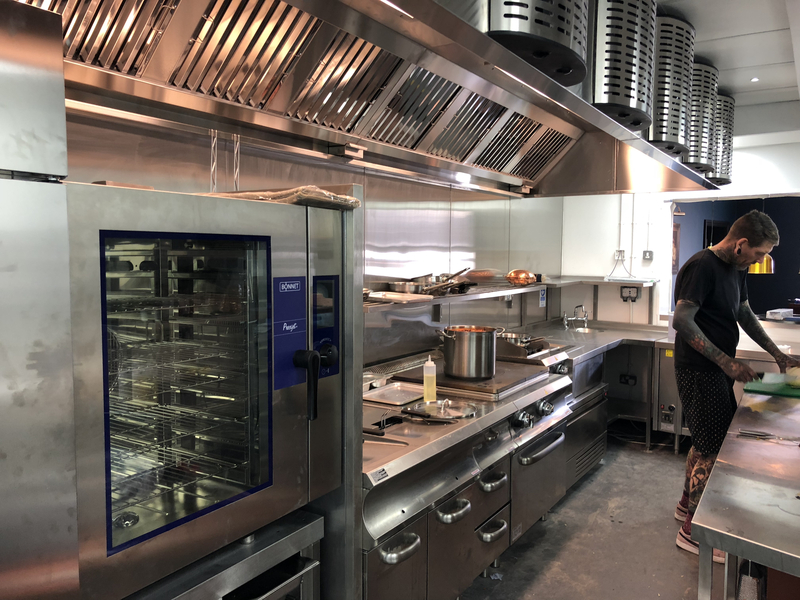 As RCE Services is known for our experience in restaurant renovation and catering services installation, we were the first choice to complete the renovation project for The Maven. The success of The Maven’s first venture meant that as they now had a reputation as an exclusive, hidden cocktail bar accessible only to those “in the know” – there was a specific requirement when it came to the design of the new restaurant. 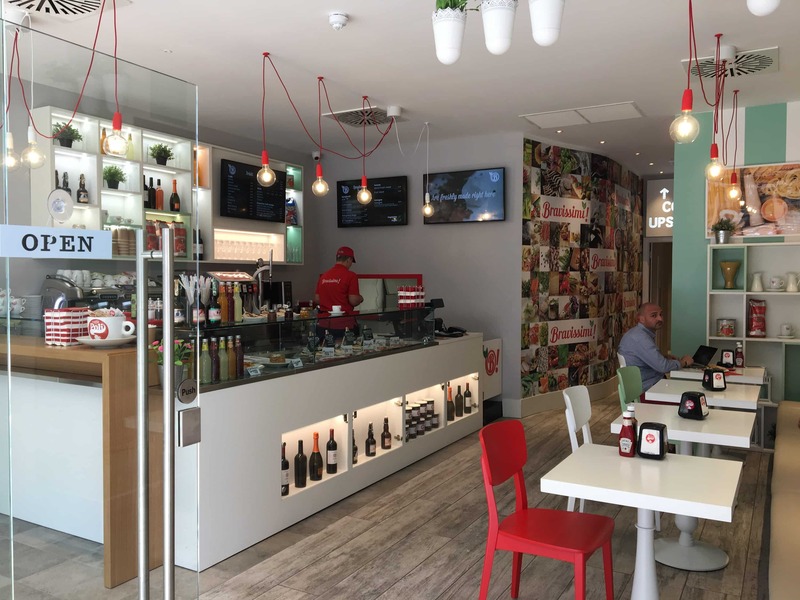 The brief was to renovate the second-floor restaurant in a style that would seamlessly fit with their current business. 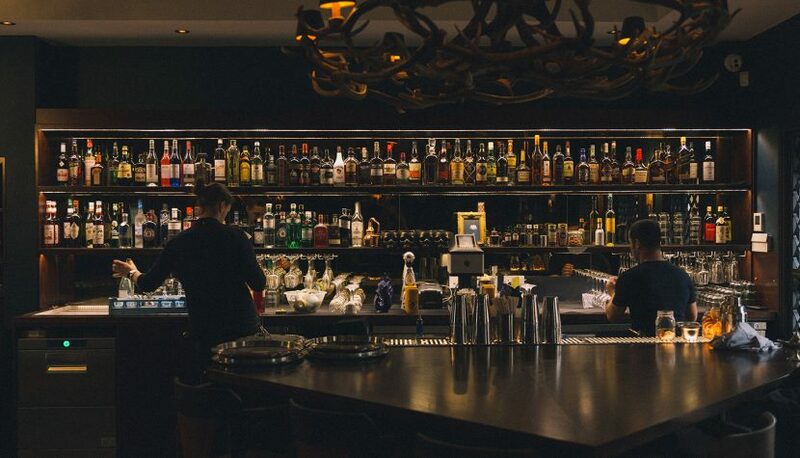 Customers should be able to relax and enjoy vintage cocktails in the downstairs bar before continuing their evening in the restaurant above without any discernible change in design or atmosphere. The Maven wanted the second-floor space divided into private rooms for group bookings and events, as well as a larger restaurant and kitchen area. Unfortunately, as the building dated back to the early Victorian era, the rooms currently situated on the site of the restaurant on the second floor of the building were set unevenly and over different levels. There was currently no room for a commercial kitchen. To overcome this problem, we fixed flaws in the existing structure in order to stabilize and level out the entire second floor. This allowed the layout for the creation of the required private dining areas and restaurant. To create a space for the kitchen, we made use of the existing light well situated in the middle of the building and the premises next door. To facilitate the building of the kitchen, the light well was filled in and a fully equipped commercial kitchen was fitted in its place. 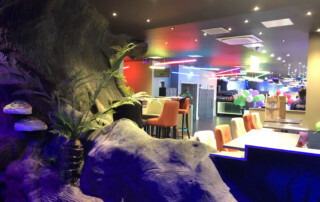 RCE Services also fitted all electric and lighting elements, air-conditioning, a state of the art audio sound system, data cabling, fire alarm, wooden flooring and the professional commercial kitchen, and a fully equipt bar, as well as sourcing furnishings and adding the final decorative touches to the restaurant. New York House on Harper Street, Leeds is an exciting new office space housing various different businesses in a convenient location in the heart of the city. The Victorian architecture on Harper Street dates back to the 19th Century. 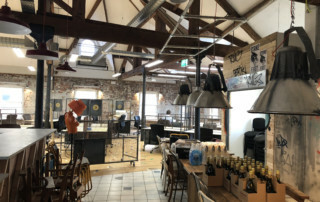 Buildings, previously used as warehouses, bazaars and industrial buildings have now been transformed into modern office spaces, shops and bars. It is also still the site of the famous Leeds Markets. New York House is a 19th-century Victorian red brick building that was previously used as a warehouse and industrial space. 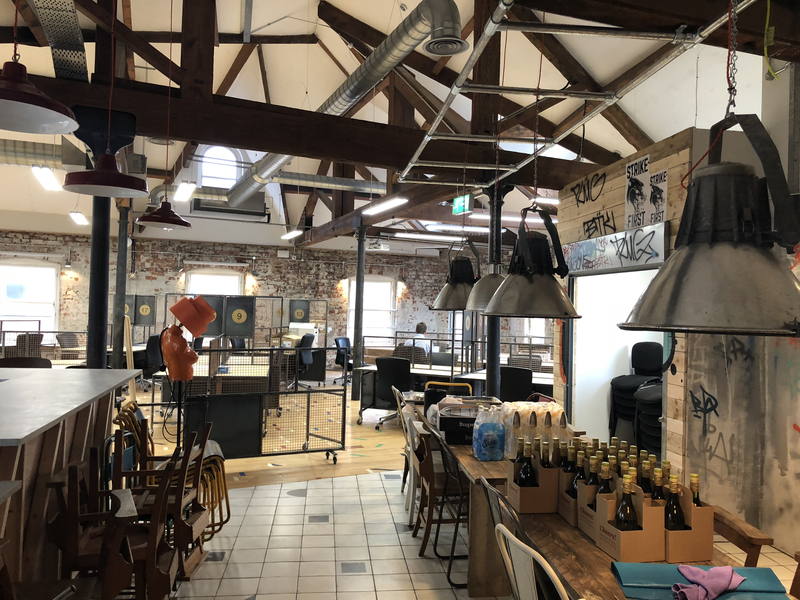 Our brief was to create a trendy, contemporary, loft-style office that would be suitable for open plan working, whilst also providing essential private space for single offices, staff and client meetings as well as a communal bar and hang-out area. 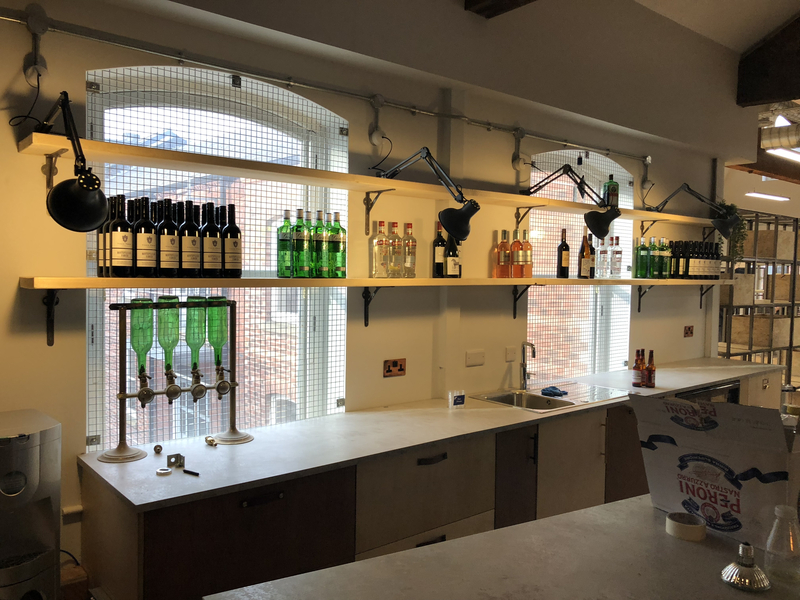 It was important to create a space that was suitable as a modern work environment, whilst also retaining and restoring many of the original period features of the building. 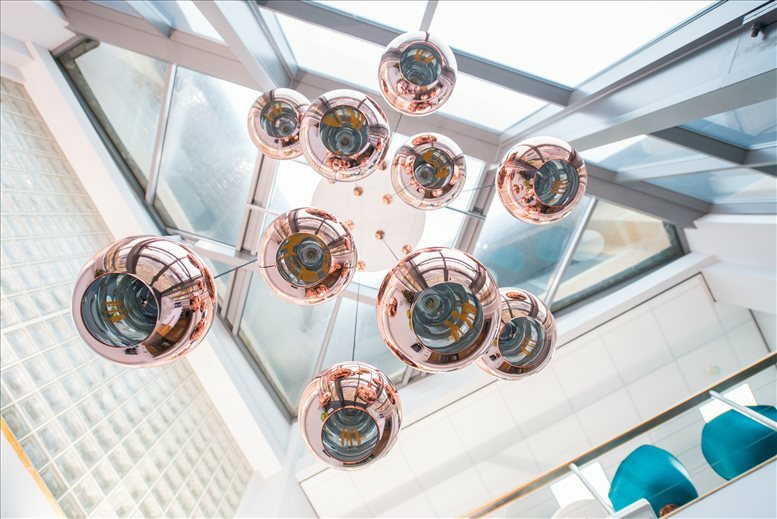 The office was set on the third floor of the building; as there was no lift installed, we manually transferred all of the materials needed for the renovation using the building’s staircase. Many of the brickwork walls inside had been plastered over by previous occupants. 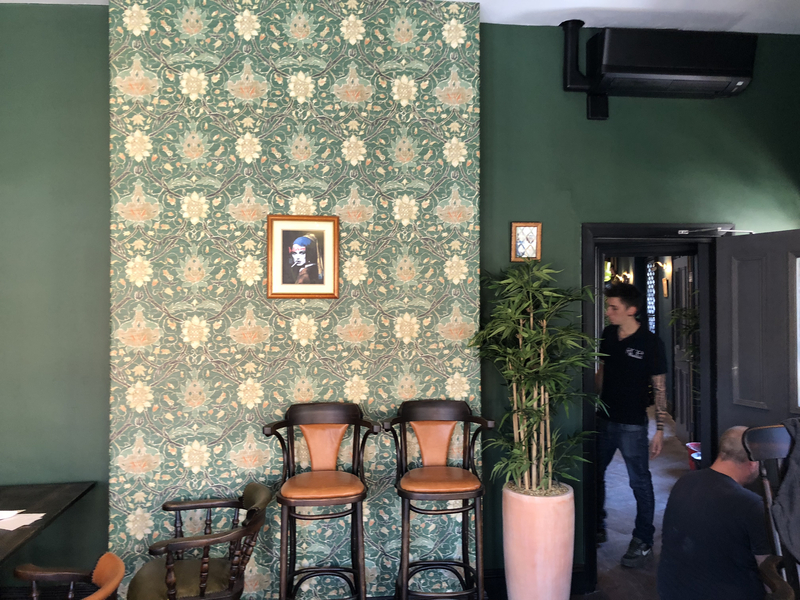 To preserve this feature, we carefully cut back the plaster to expose the original Victorian brickwork, restoring the original character of the space. 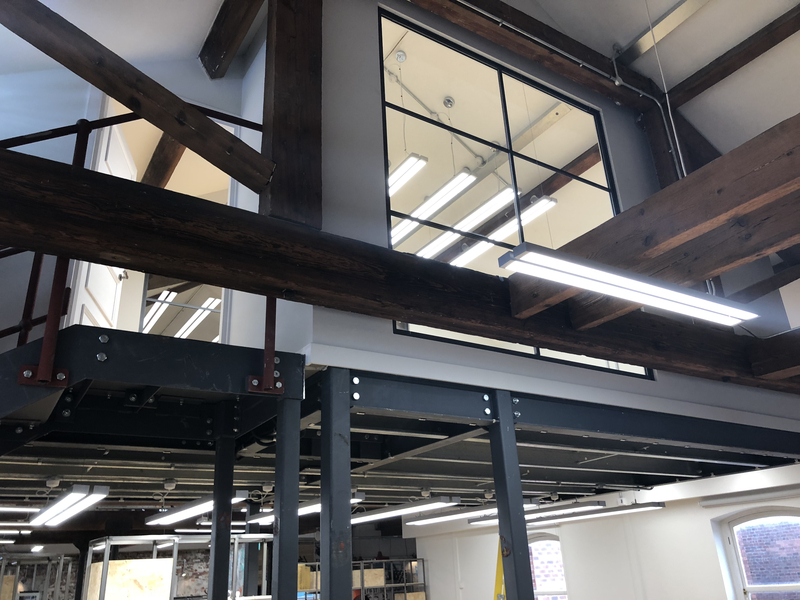 The exposed beams are part of the original structure of the building, with reclaimed timber used for any parts of the renovation requiring wooden structure in order to blend in with the existing woodwork. In keeping with the industrial origins of the building, we used unusual reclaimed, hard-wearing gym flooring. We also installed visible duct air conditioning which runs through the open loft space. 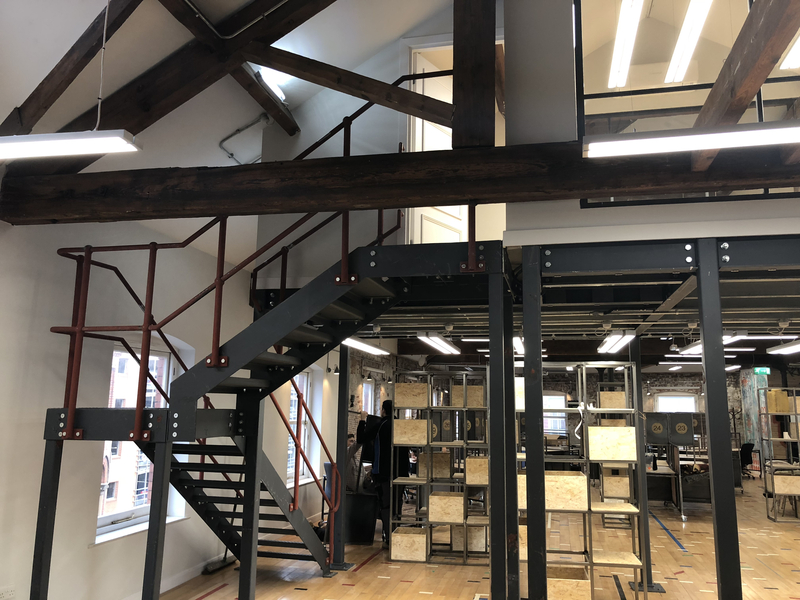 A private office was created on a mezzanine floor level, will floor to ceiling square, iron-framed windows fitted to ensure it wasn’t completely closed off from the open-plan lower floors. 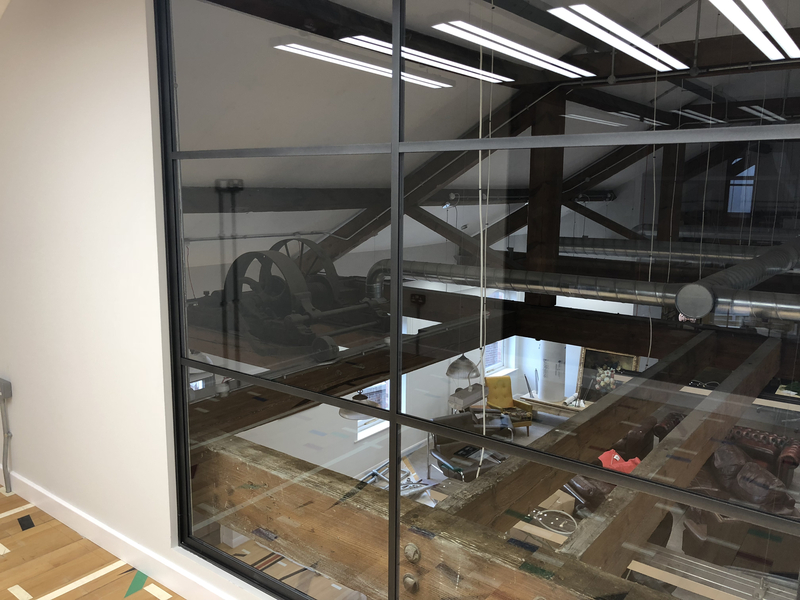 The windows achieved a view over the lower office space and directly onto the striking original industrial iron wheels located over the eaves. RCE services installed all lighting, electrics, a state of the art fire alarm system, air conditioning and flooring. The entire refit was completed in just 8 weeks. 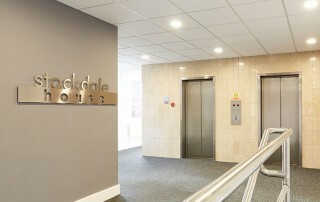 We were delighted to be asked by Beta Housing to refurbish an old, tired office block in Bradford. They wanted us to transform the dated 90’s building to create a modern work and meeting space suitable for several businesses to share. The idea was to create a bright, airy office that reflects a more modern, inclusive and open plan way of working without sacrificing privacy or low noise levels. 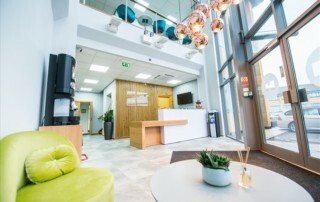 The space needed to incorporate a large reception and welcome area for staff and visitors that led to individual offices and organised meeting rooms. 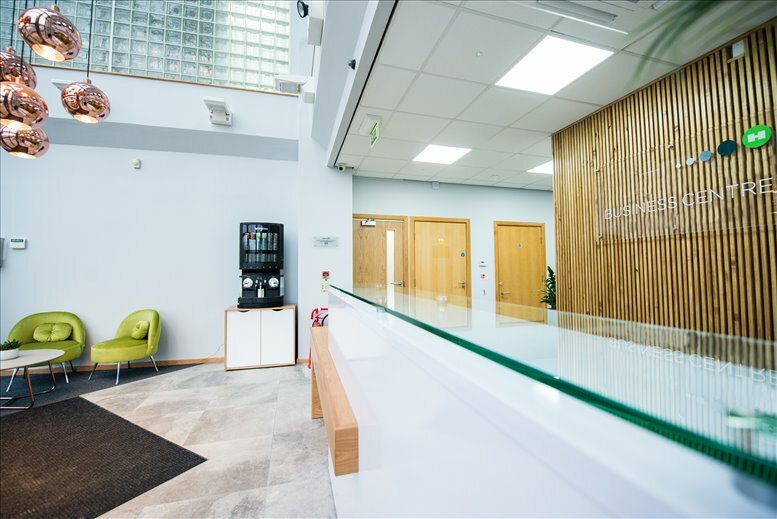 RCE services completely refurbished all of the offices and reception areas, transforming what was previously a dark and cramped interior with a new, contemporary but practical layout. RCE services also fitted a bespoke communal kitchen where staff could socialise, make food, relax and enjoy their lunch breaks. 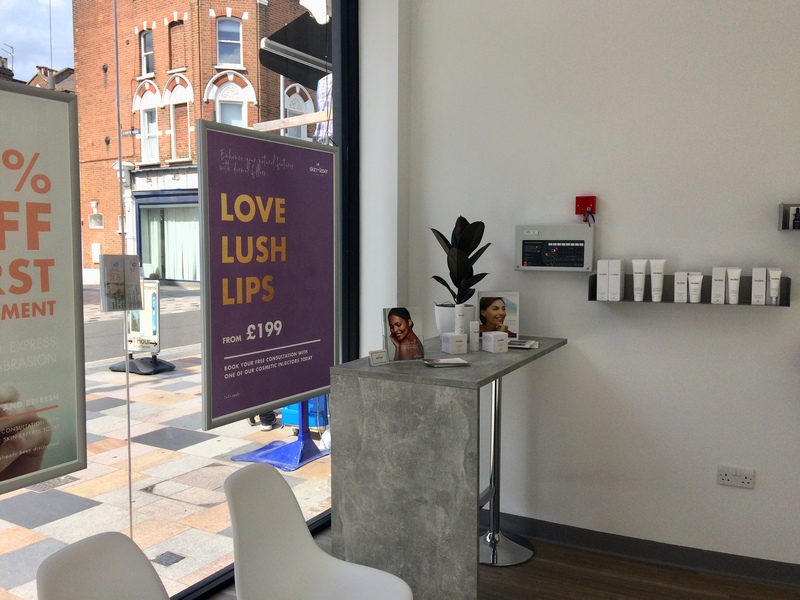 We also installed several new partition walls and sourced bespoke furniture that fitted the space, designed with specific measurements and colour palette. 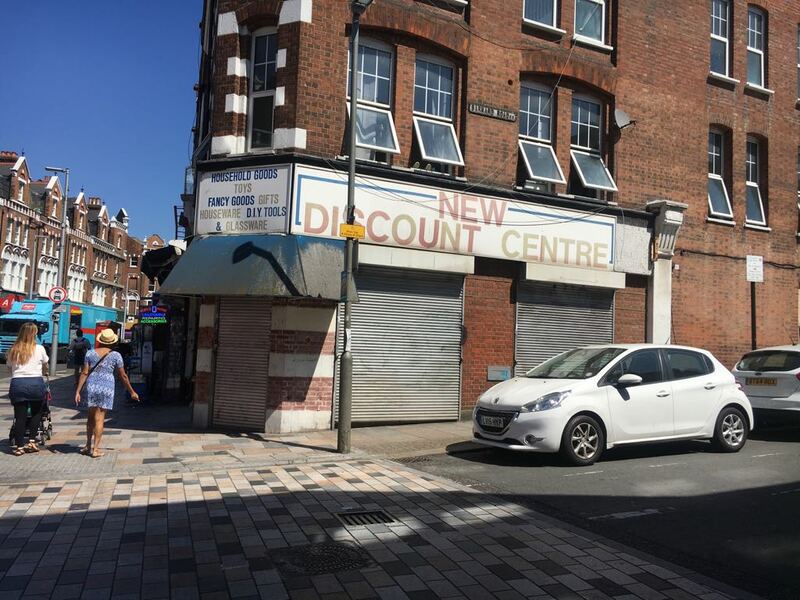 The work wasn’t purely cosmetic, the building also needed considerable updating with new air-con, lighting and electrics and the installation of data cabling for IT which was all provided and fitted by RCE Services specialist team. 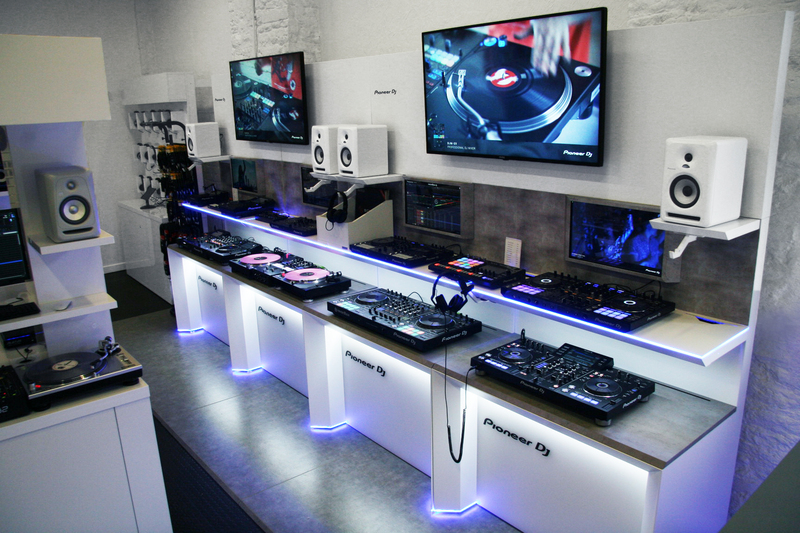 Bop DJ is one of the UK’s largest suppliers of DJ equipment, retailing to the entertainment and leisure industry as well as individual clients. 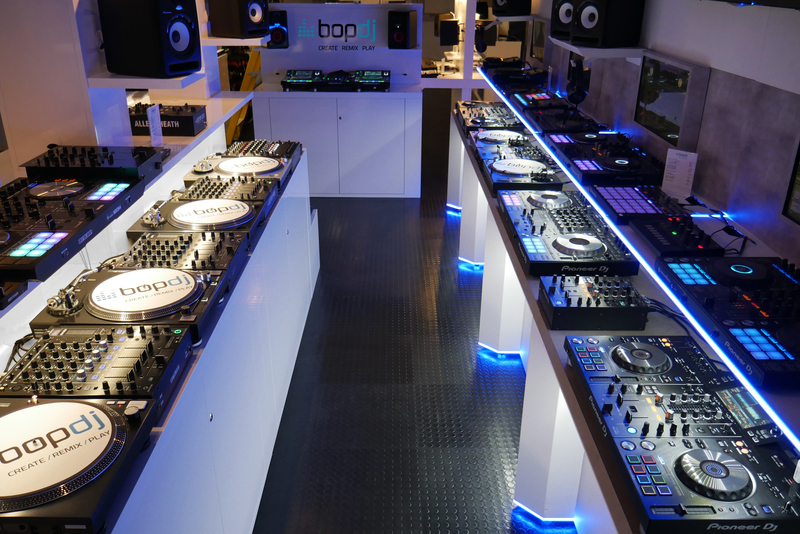 After fitting Bop DJ in stores in Bristol and Leeds, we were pleased to help them add their new showroom in Manchester to their portfolio. A railway arch near a train station provided the unusual site for the new Bop DJ showroom. 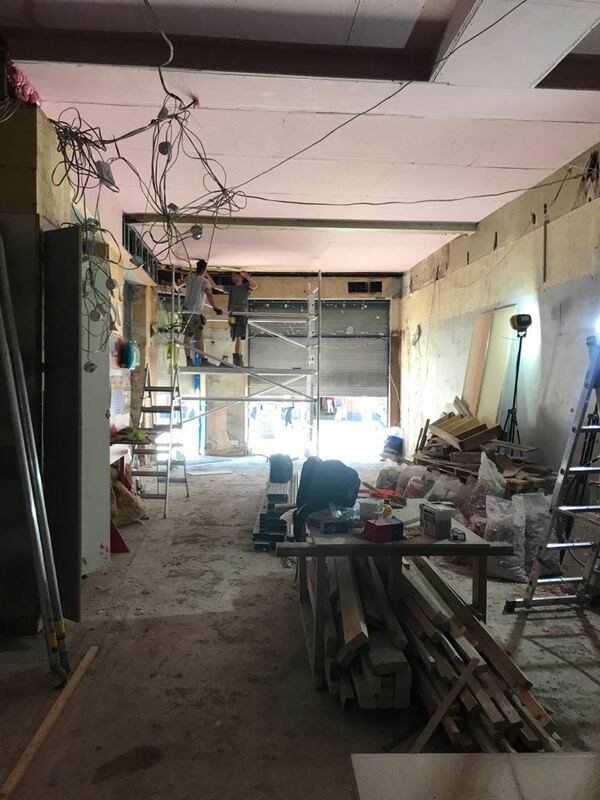 It hadn’t been in use as a commercial let before, so there was a considerable amount of essential work to do in order to turn it into a world class showroom for the latest sound equipment. 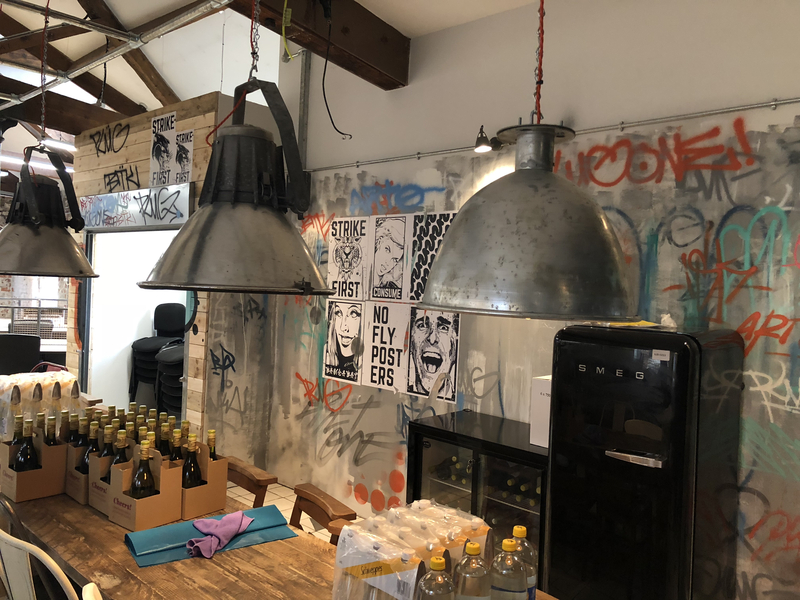 This included fitting plumbing, air conditioning, electrical work, a mezzanine platform for functions and events, installation of studded rubber flooring, fitting bespoke furniture provided by Pioneer and the cladding and painting of the vaulted ceiling. We also installed CCTV security and a data communications suite. The entire renovation was completed within deadline, taking just 4 weeks from beginning to end. 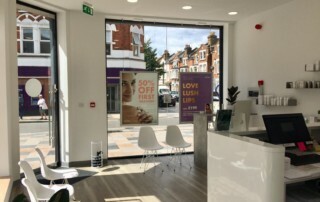 In those 4 weeks, the site was transformed into a spacious and well laid out shop with a fantastic, state of the art showroom on the first floor. The mezzanine level with extra function space opened up the function and potential of the shop. 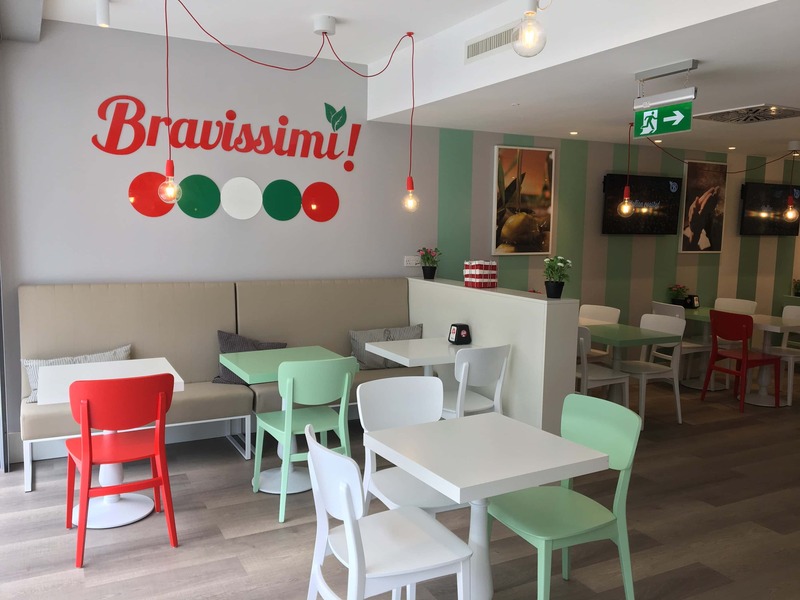 RCE Services recently completed a contract for Italian company Bravissmi on there latest restaurant at Piccadilly Station Manchester. 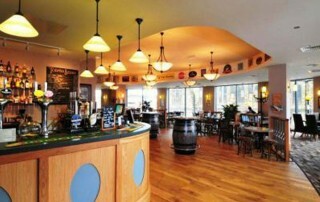 RCE were instructed to fit out the restaurant on a design and build basis. 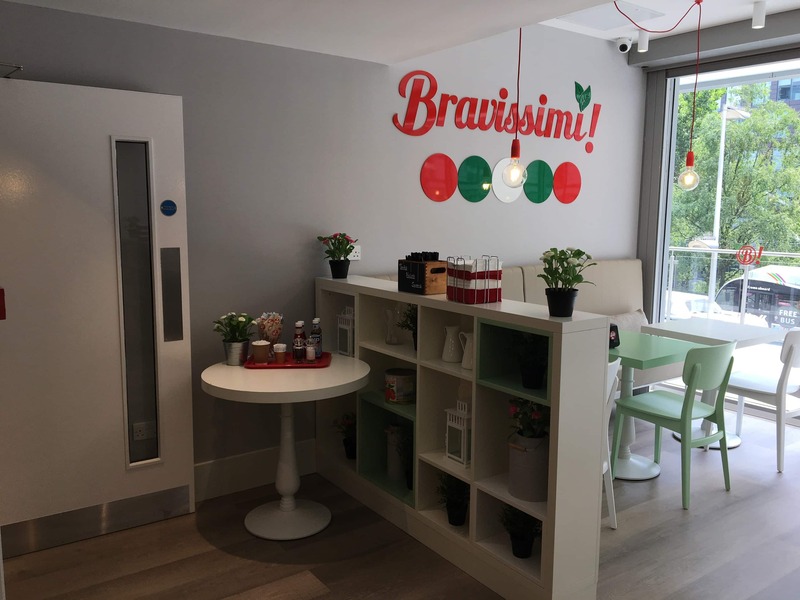 Bravissimi selected RCE services because of the complexity of services required and the high quality of our own in house mechanical and electrical department. 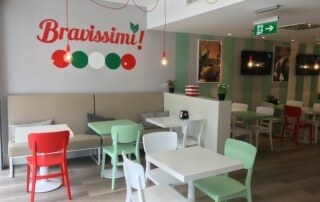 We were contacted by Bravissimi as they were in the process of moving from Italy to Britain to set up the restaurant. The site was in a very prominent location immediately outside of Piccadilly station in Manchester. 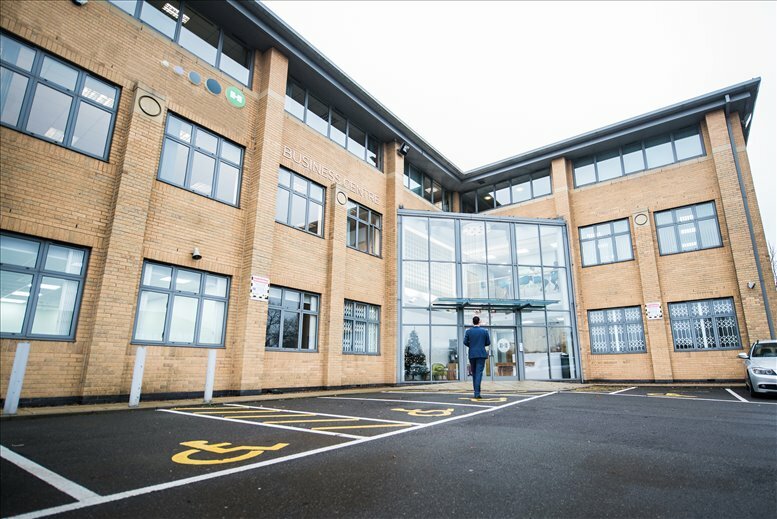 Delivered as a shell by the landlord, RCE services completed the entire build within just 6 weeks. 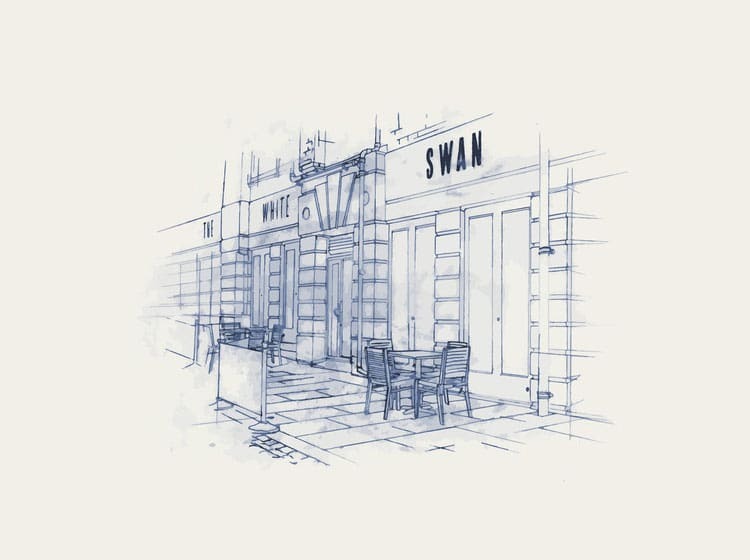 This includes a commercial kitchen, air conditioning, plumbing, flooring, electrics, tiling, bespoke furniture and sourcing tables, chairs and other furnishings. We worked closely with our clients supplier in Italy to deliver the exact specifications including specific bespoke furniture that we imported. Due to the busy location, it was essential that we didn’t take materials in or out of the building during peak-times so as not to disturb commuters. We also ensured the site was completely secure and inaccessible to members of the public. 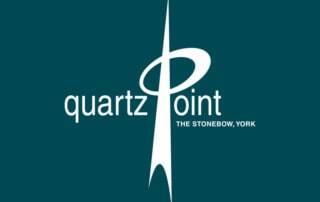 We pride ourselves on having worked very closely with European clients for over 10 years. 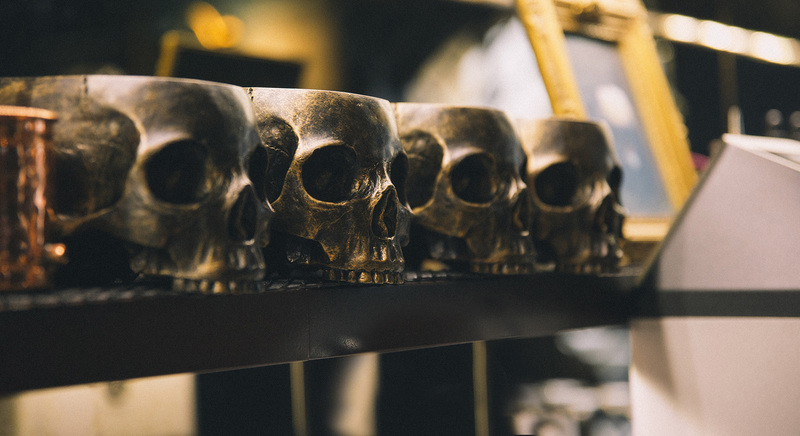 We can provide compliance guidance and assistance, as well as advise on the general compliance needed for working within the strict regulations of the UK. This includes electrical, plumbing, gas and air conditioning guidelines. 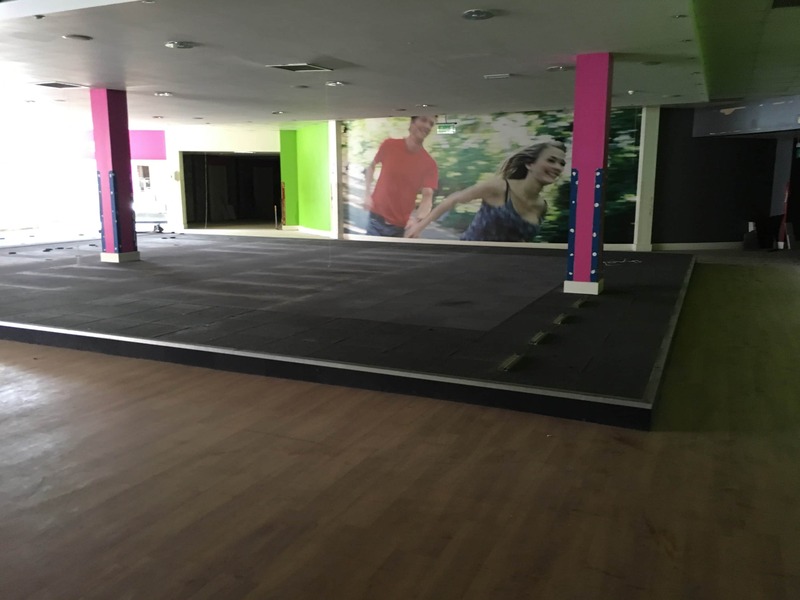 RCE services were contacted by Burhill Group, a large leisure company owned by Guiness, to complete a large fit-out in Milton Keynes. 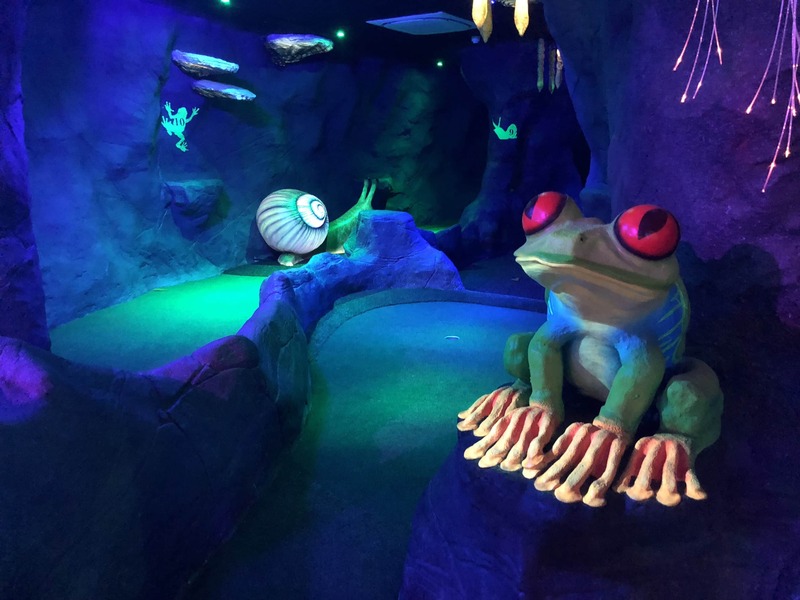 The project, Mr Mulligan’s Lost World Golf, would be a new addition to one of several adventure venues across the UK with a fantasy mini-golf theme. The site was a set of commercial units – formerly a gym – within a leisure complex located in Milton Keynes theatre district. 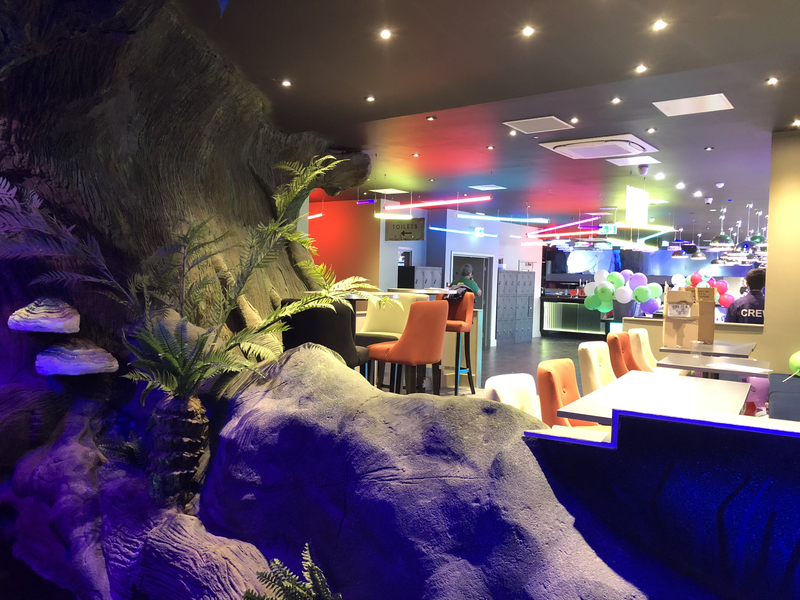 RCE Services brief was to completely transform the venue from its current dilapidated state into an amazonian jungle, complete with restaurant, bar and reception area. 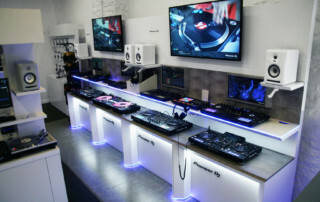 The entire fit out was to be completed within 8 weeks. At RCE services we understand the importance of delivering projects on time and within budget. We have a reputation for delivering quick turnaround on high pressure jobs with time constraints, so for us, this limited timeframe wasn’t a problem. 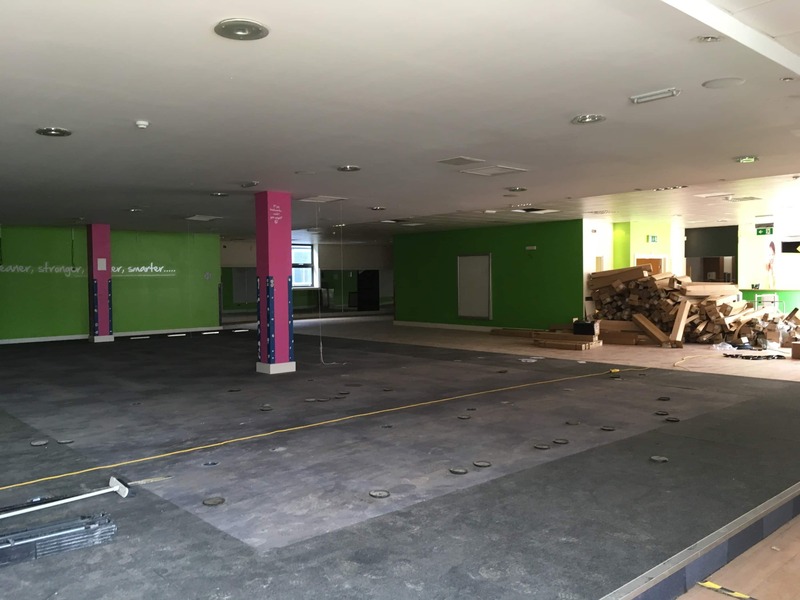 As the units were formerly used as a gym, the first stage of the contract was to strip out the old fitting including flooring, walls and electrical systems, bringing the unit back to a shell. Once the unit was back to its original state, we began the job of fitting out the interior. 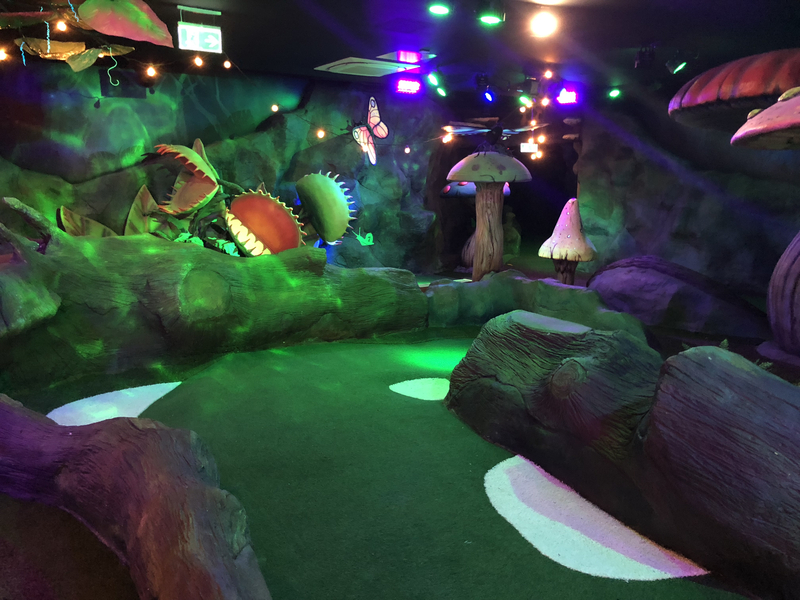 This involved installing partitioning walls, ceilings, flooring, electrical installation, air conditioning, plumbing, commercial kitchen installation, golf course build and decor and finishing touches. 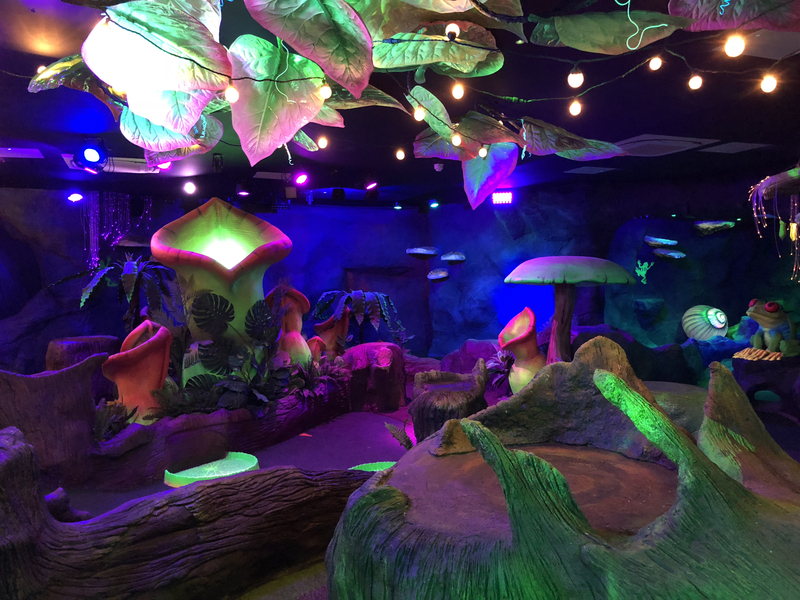 Burhill’s adventure venues are known for their extravagant and playful interiors. 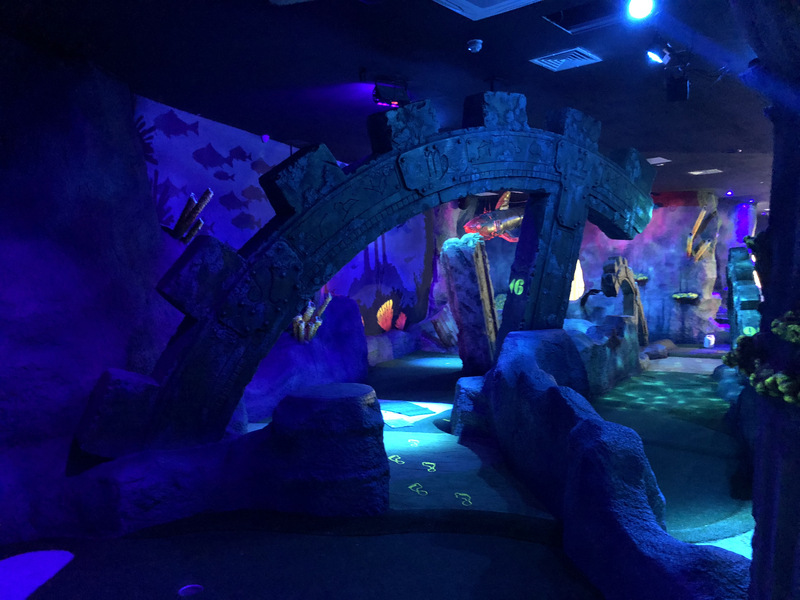 In keeping with the Lost World theme, we created a magical underground rainforest cave housing their stunning mini-golf course. 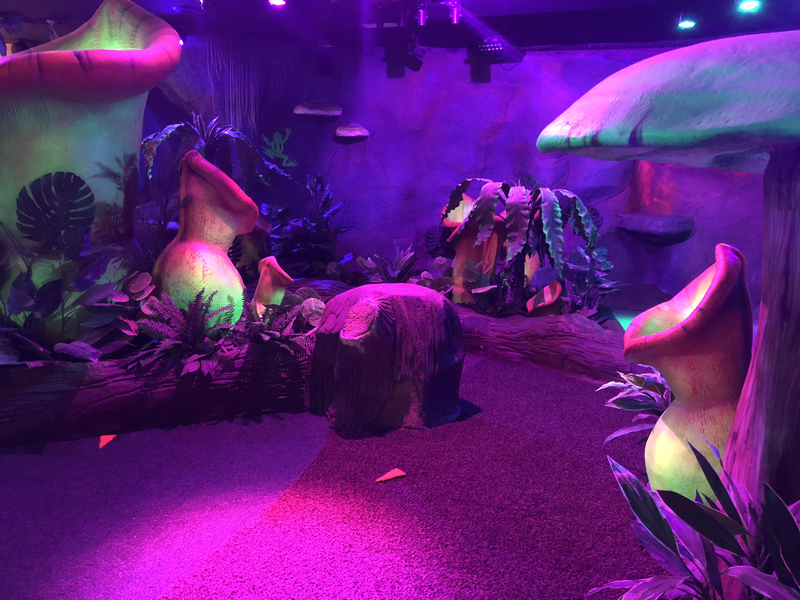 We did this by taking a formerly unused space within the unit in which we prepared and created sprayed concrete rock work and features, mowed load lightings, a tiger dimming system, colour style programming and DMX special effects control. 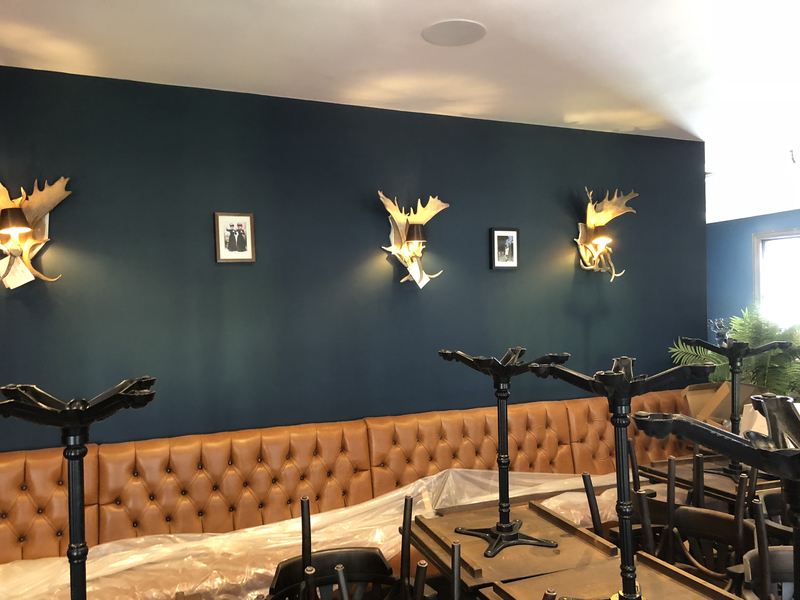 As RCE has a technical services background we are able to deliver the highest levels of in-house service integration and this fit out was a perfect example. 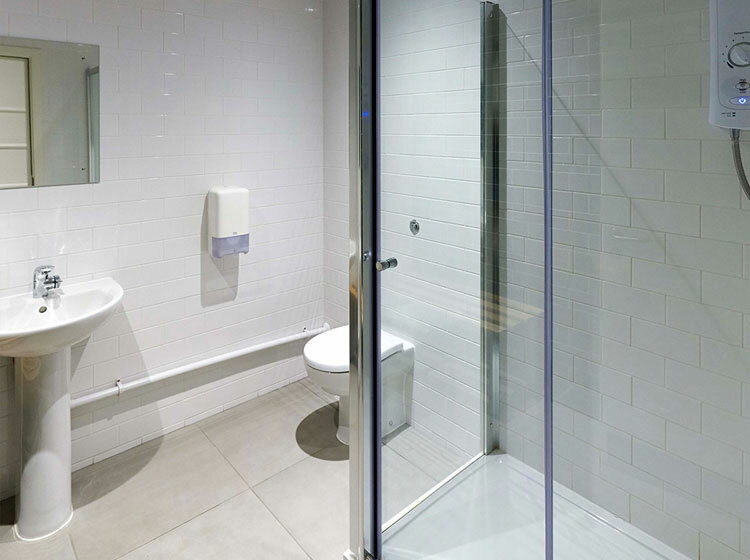 We ensured complete integration of all systems including lighting, electrical features, audio and ventilation. 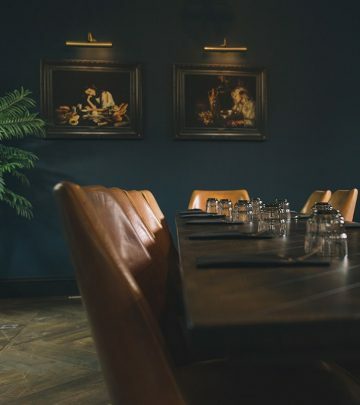 With one central control switch for everything, all systems within the building were pre-set meaning no input from staff was needed.This ensured all Mr Mulligan’s staff could open up and close down the venue quickly and efficiently, saving valuable time for the business. 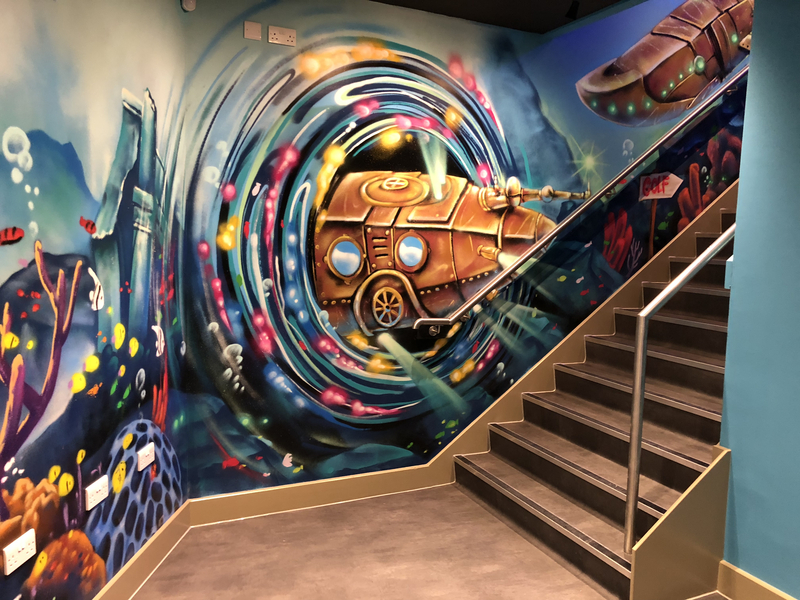 During the project, we had to consider that the unit was next to a huge theatre in Milton Keynes, so making noise as certain times would have caused disruption for surrounding businesses. To avoid this, we completed any work likely to cause noise outside business hours and ensured that deliveries and removals were timed accordingly. 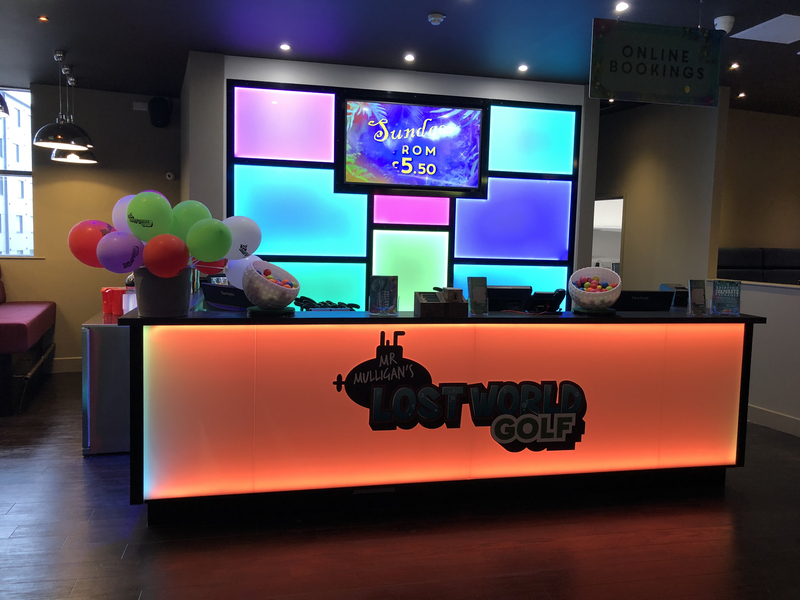 After a personal thank you from the the CEO of Burhill Group on the opening night of Mr Mulligan’s Lost World Golf, we are looking forward to working on their next projects in Birmingham and Bournemouth. 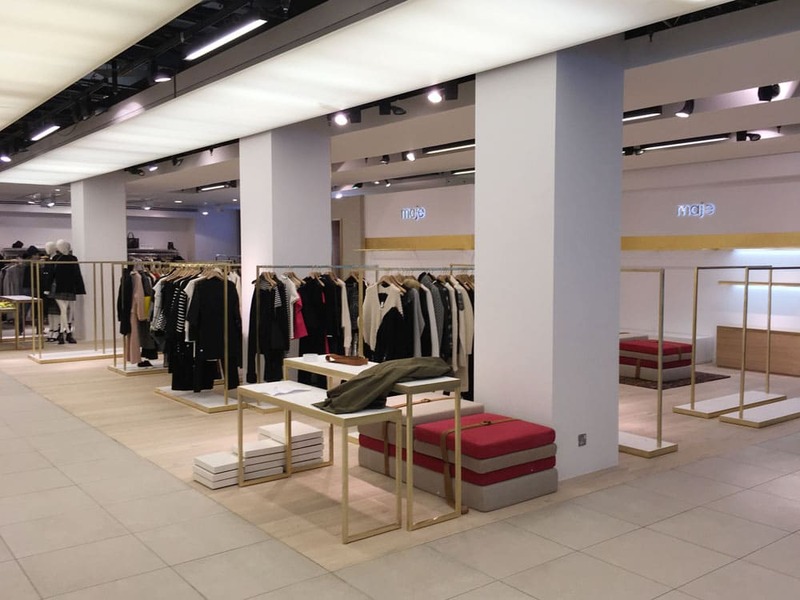 Simultaneously to the Sandro concession re-fits, RCE Services was approached by the stylish and elegant French women’s ready-to-wear store Maje to complete a full re-fit of their concession within Selfridges within a three week time frame. 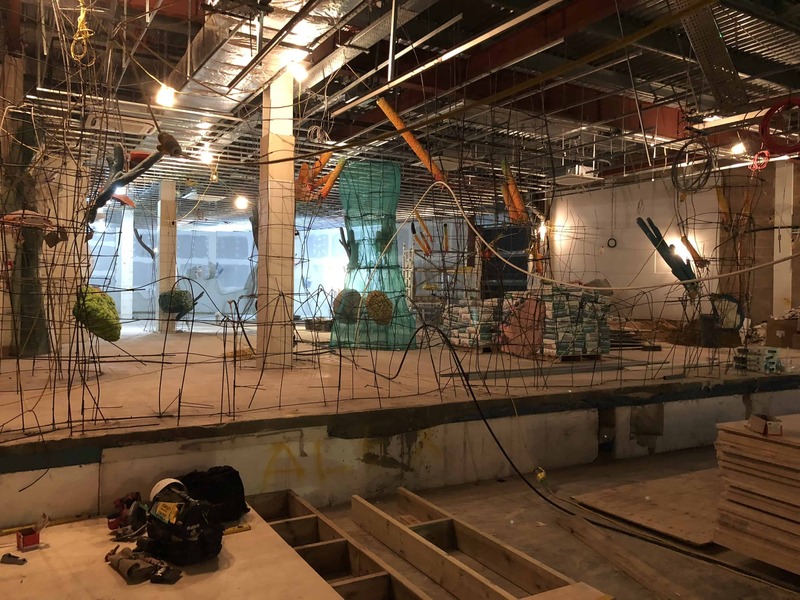 Again, to ensure the rest of the Selfridges store remained open to their exclusive customers, it was necessary to carry out all the works behind hoardings and a great deal out of trading hours to ensure minimum disruption. 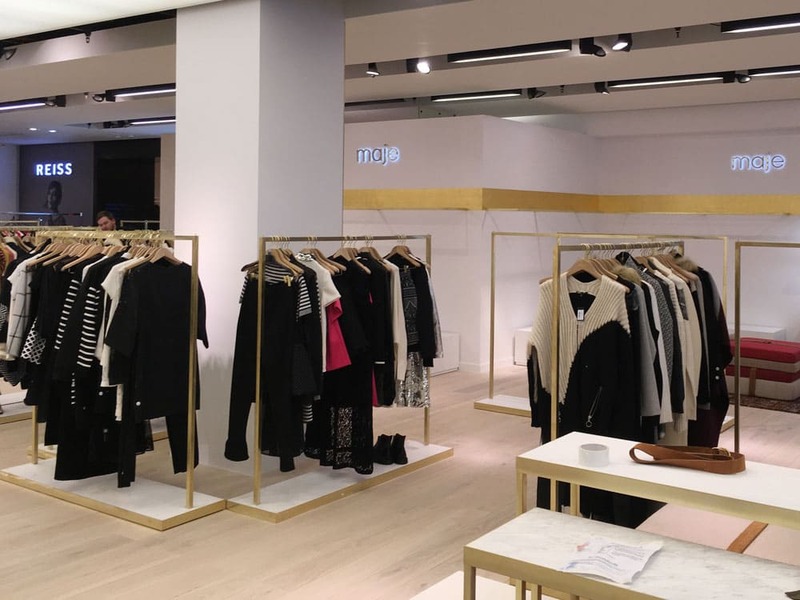 The Maje concession sits side by side with Sandro and therefore to ensure pleasing aesthetics, we were again required to remove and relay a resin floor, fit travertine shelves and the matching onyx panel as can be seen in the Sandro concessions. To ensure maximum comfort for the Maje clientele, changing rooms were partitioned and altered but perhaps the most impressive feature of Maje is the beautiful gold leaf frieze that RCE Services created. 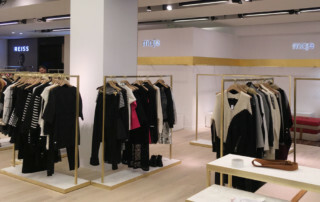 Along with freestanding and wall fixed furniture as well as illuminated backlit logos throughout the retail space, Maje not only links with the concessions around it but also stands alone as an exquisite, luxury retail space. 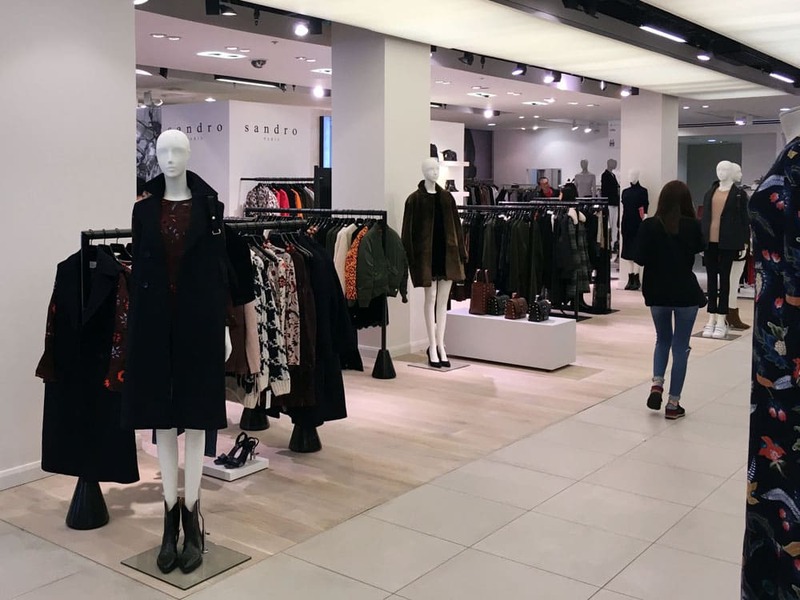 Due to the success of our electrical work in Covent Garden Sandro store RCE Services were approached to complete the re-fit of the Sandro Mens and Sandro Womens concessions within Selfridges flagship store on Oxford Street. 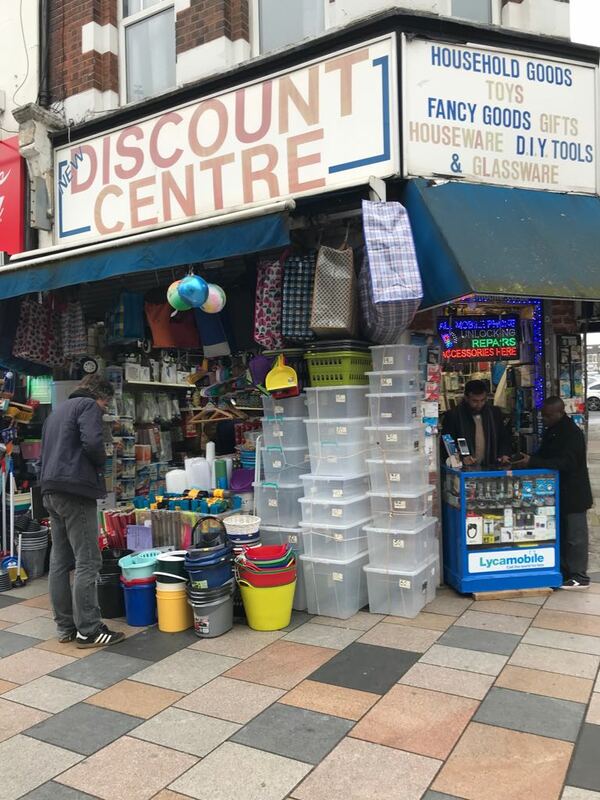 As the two concessions are surrounded by open trading floors in one of the most iconic shops in the world, with some of the most expensive designer goods on sale, the entire job had to be completed behind hoardings and mainly out of shop hours. This provided its own challenges during the two week period we were given for the fit-out. 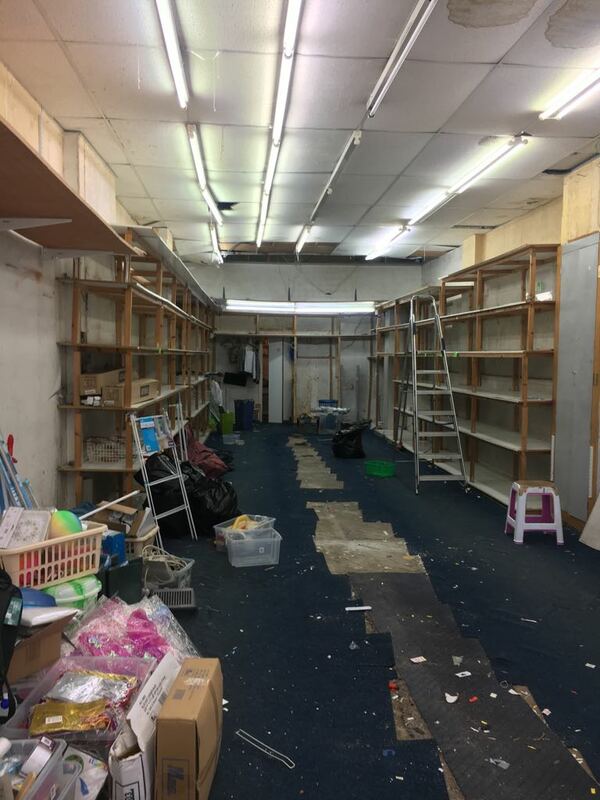 Following the removal and relaying of a resin floor, modifications were made to the partitioning in the stores changing rooms, the shop floors were completely redecorated, large floor to ceiling mirrors hung and new shop furniture installed. 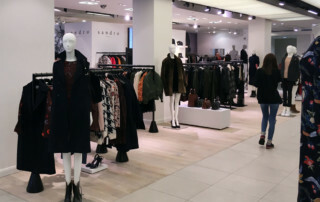 These included the travertine shelving, onyx feature panel and cash desk, synonymous with the Sandro brand. 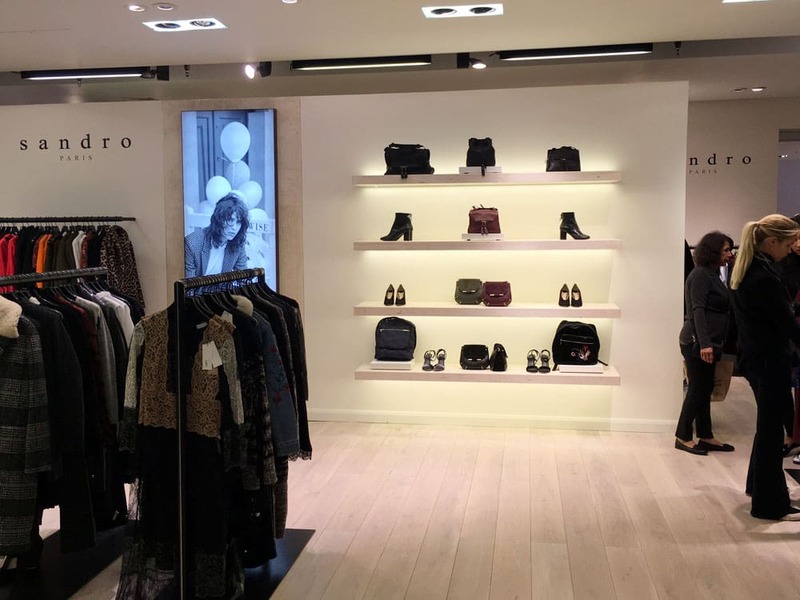 Finally, the installation of the back lit Sandro logos completed this effective re-fit without any disruption to the Selfridges clientele. 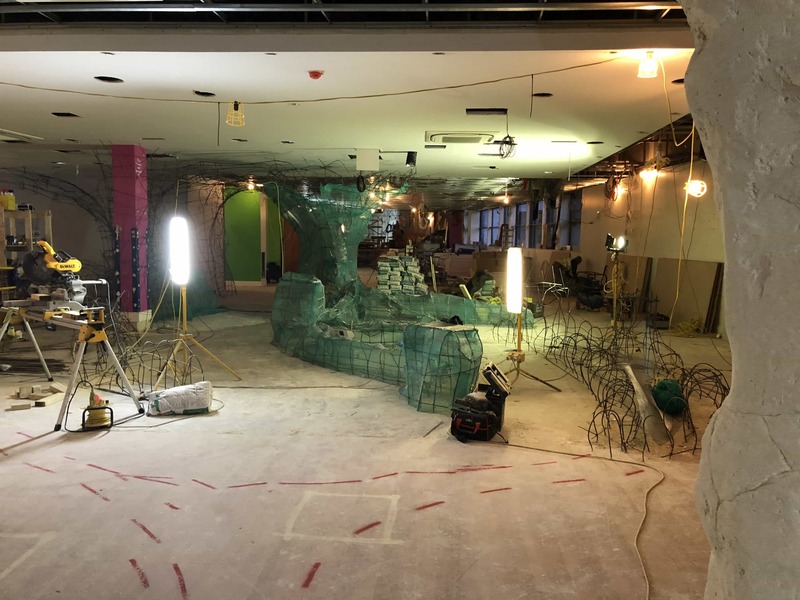 Following the end of a tenancy by private healthcare provider BUPA, Evans Property Group and Knight Frank approached RCE Services to complete dilapidations work on a vacated suite in the centre of York, a short walk from the historic Shambles. 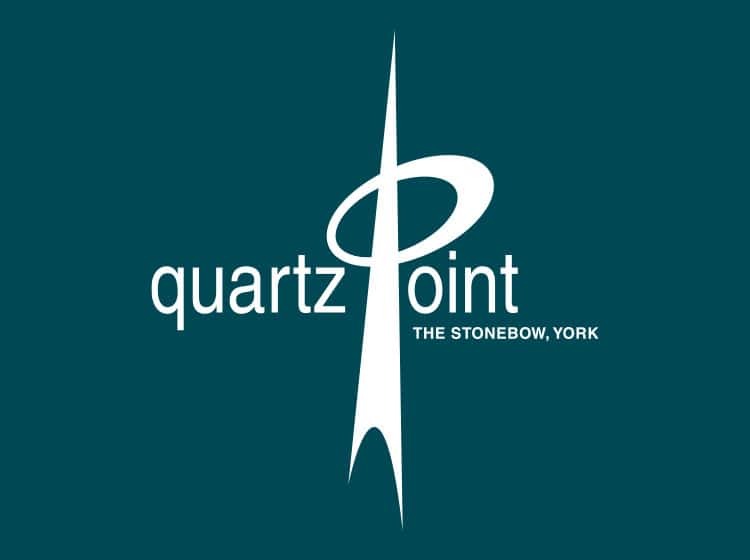 As the Quartz Point building was occupied by other tenants during the time RCE Services was carrying out the dilapidations works, it was imperative that noise levels were closely monitored and disruption was kept to a minimum. The end result was a unit prepared and ready for the next tenant to move in. 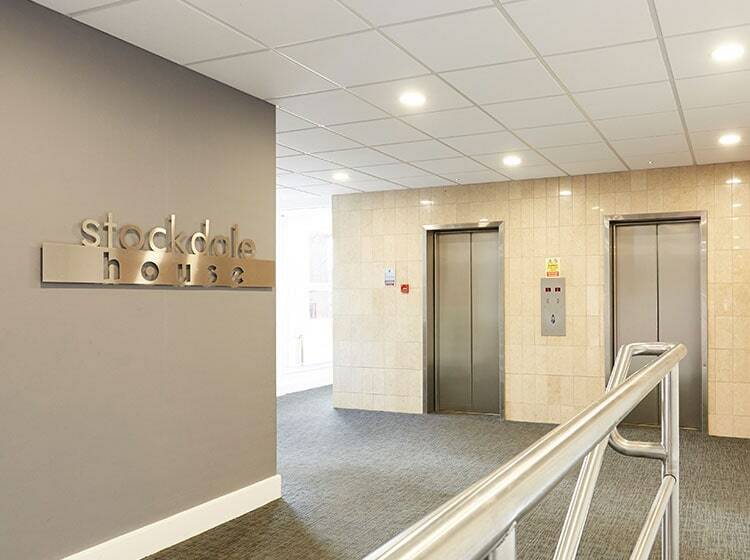 Just North of Leeds city centre, Headingley Office Park is an established development of office buildings including Stockdale House, of which RCE Services recently completed a re-fit. 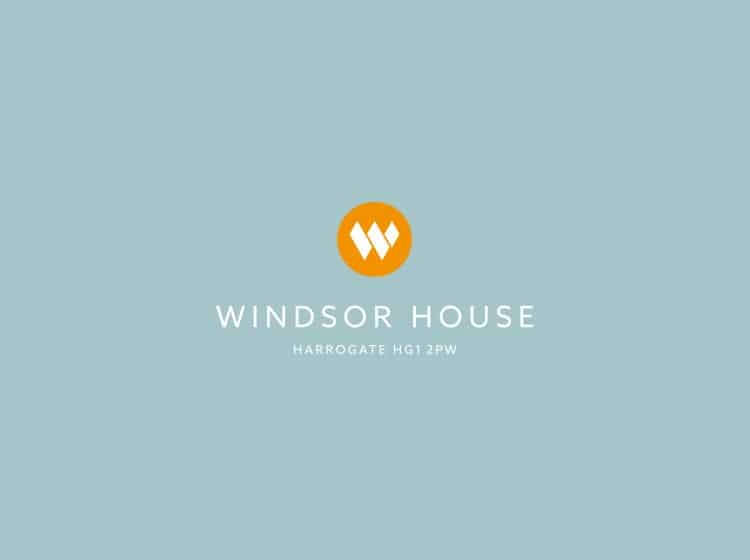 Located in a prime property in Harrogate, RCE Services fit-out some office spaces including installation of shower suites in the beautifully renovated Winsor House. 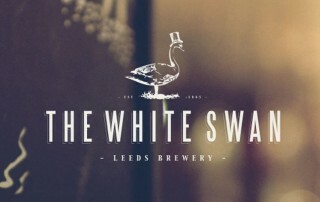 Overlooking The Valley Gardens, Windsor House offers stylish workspaces of a high standard with tenant spaces vary from 100 sq ft to 5,000 sq ft.
On an icon site next to the world famous City Varieties theatre in the heart of Leeds, The White Swan from Leeds Brewery was an important development for the growing pub group. 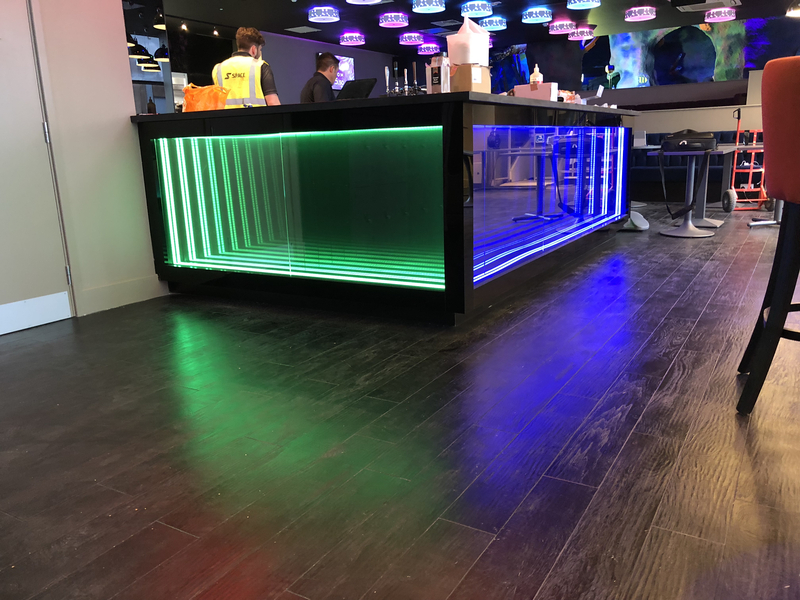 The vibrant, forward thinking company chose RCE Services to do the fit-out of this pub which was to have a contemporary edge, reflect the products sold. 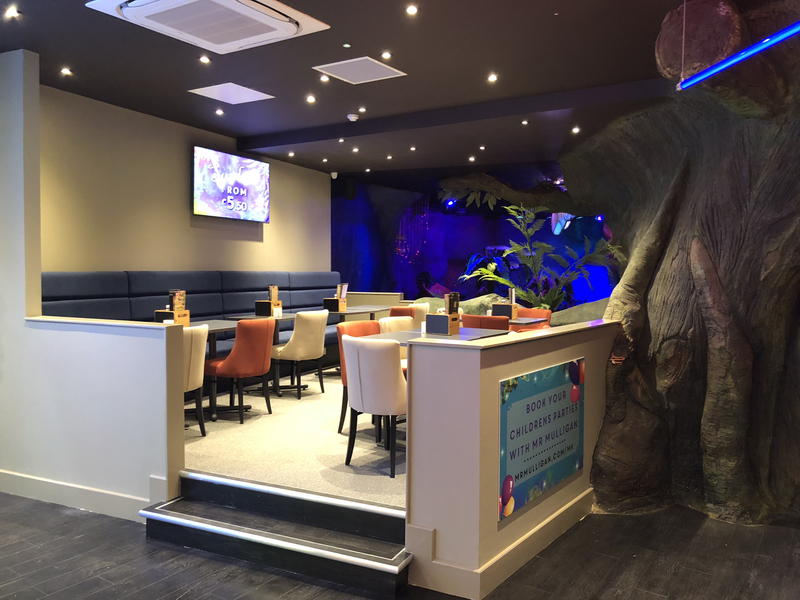 As part of our ongoing relationship with upcoming pub group Market Town Taverns we recently successfully tendered and completed fit-out of their new Leeds location – East of Arcadia. 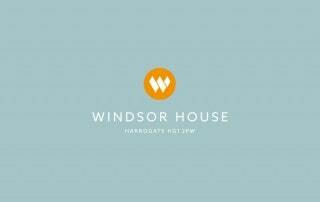 The first ‘new build’ tavern for the group is in a stylish new building in the Meanwood area of Leeds. Starting from a true blank canvas, the interior comprises of two very different areas which are visually separated by metal balustrading. One side is in the style of a continental beer hall with vintage plaques and beer posters displayed around the high level frieze. 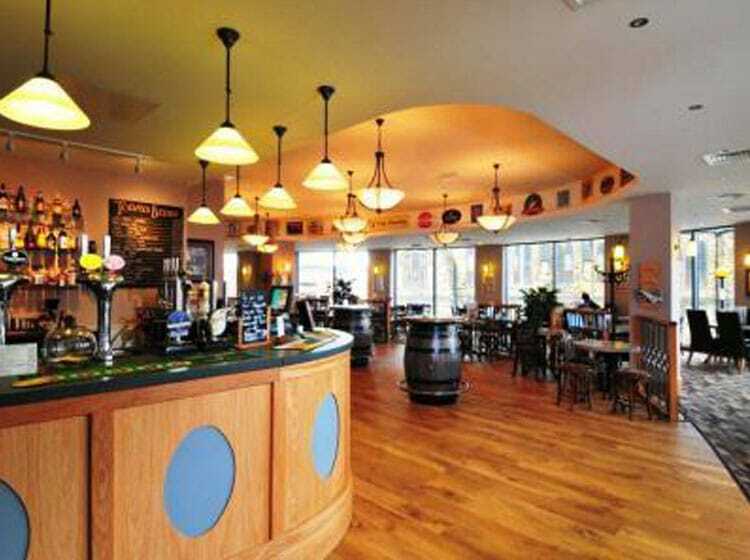 Photo from Market Town Taverns.